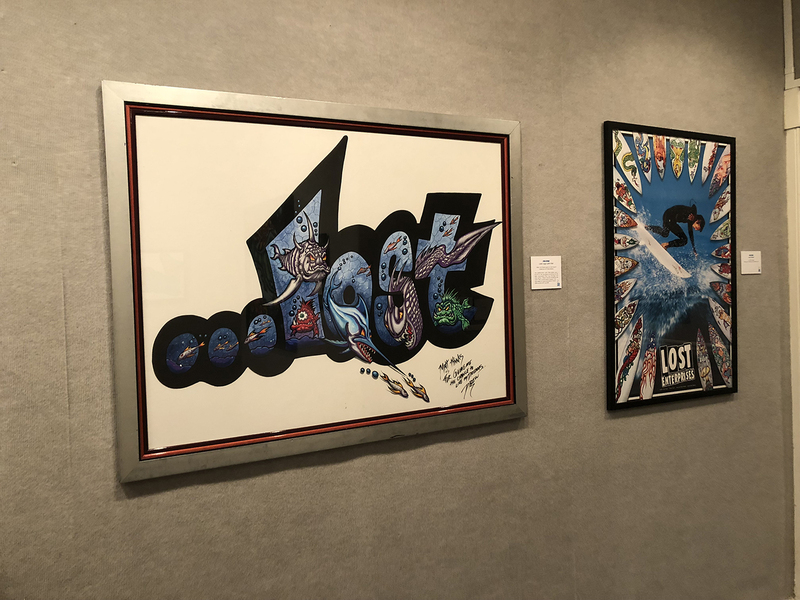 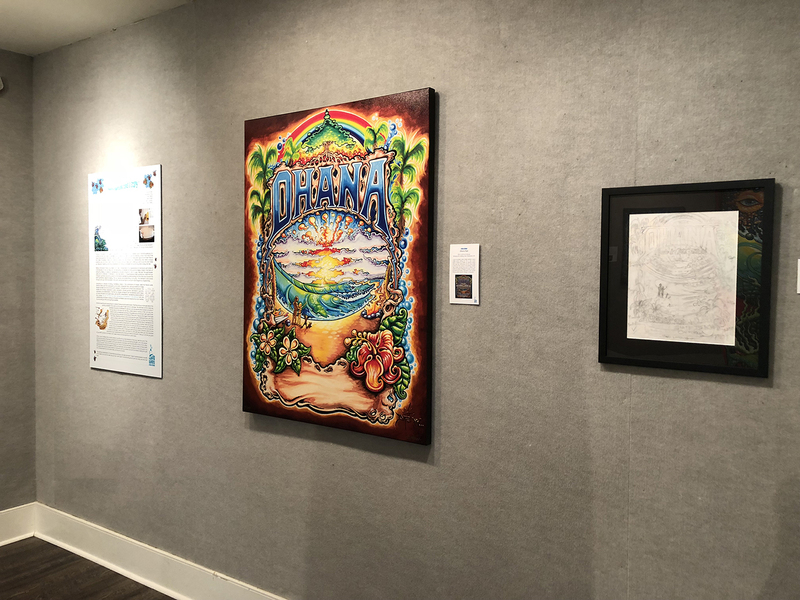 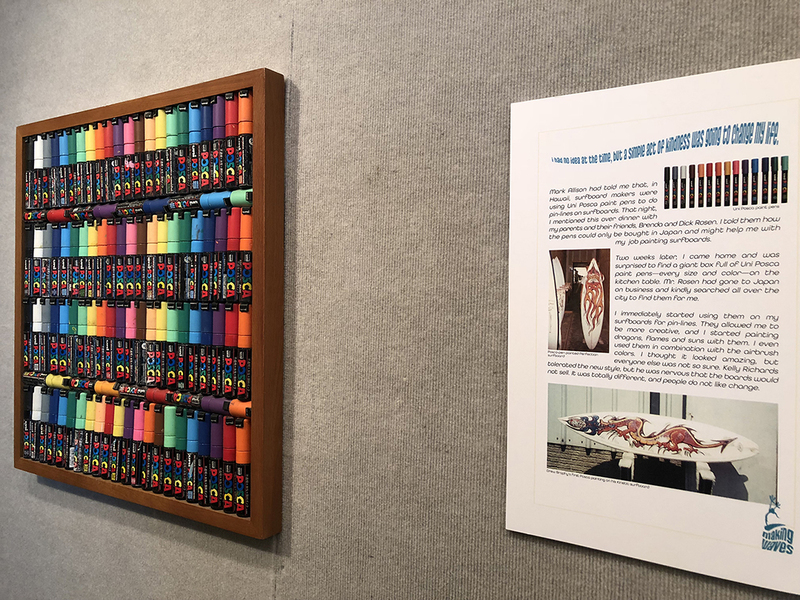 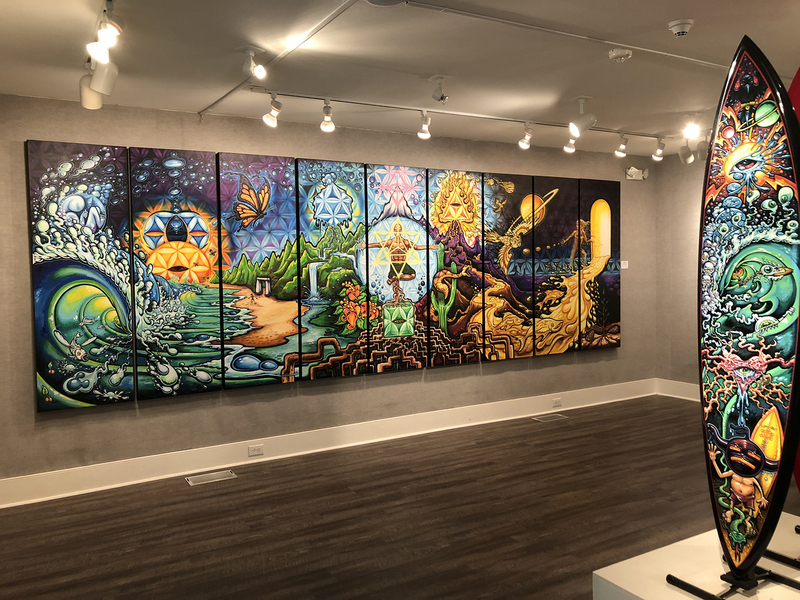 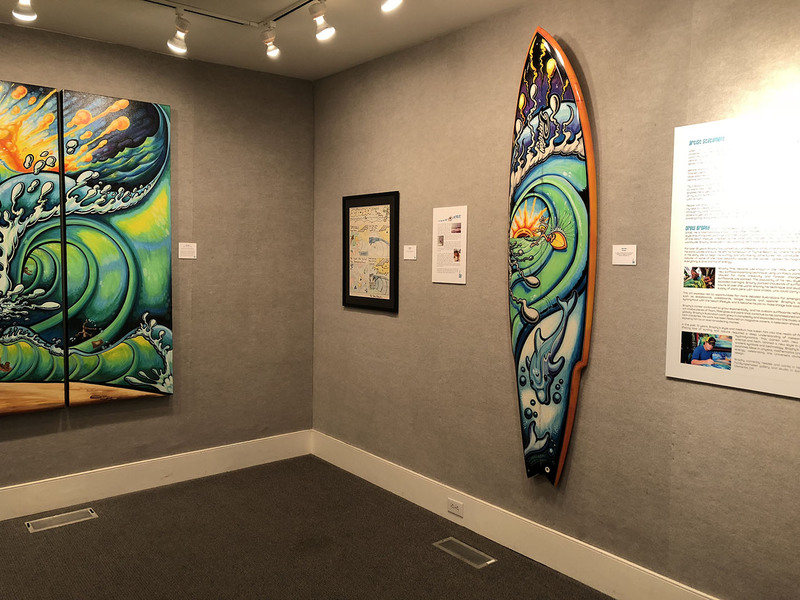 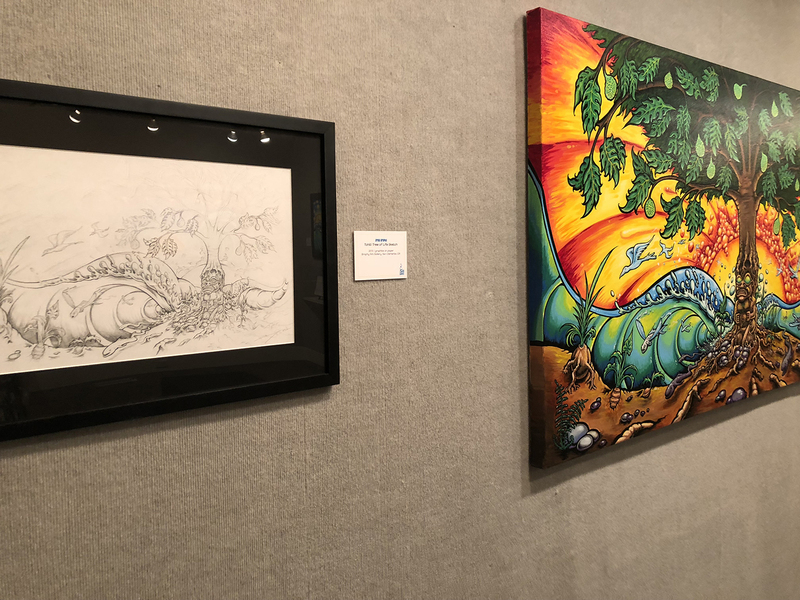 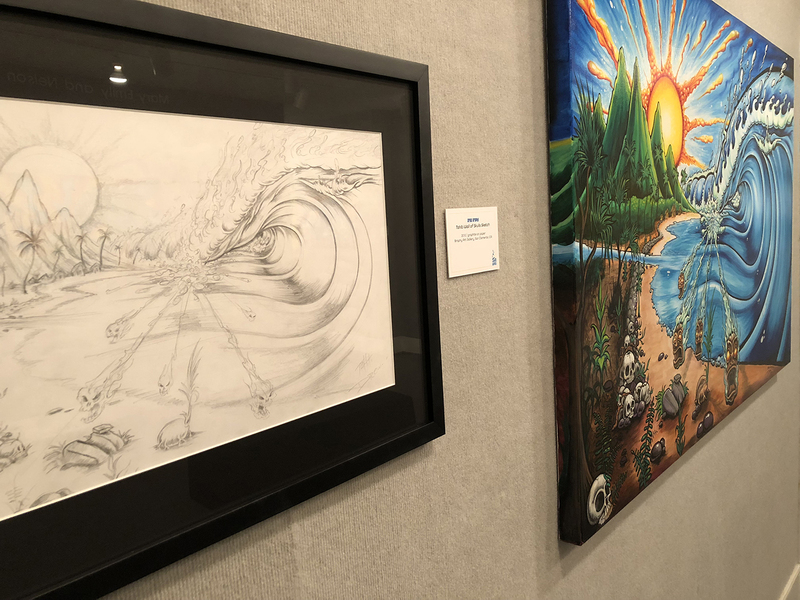 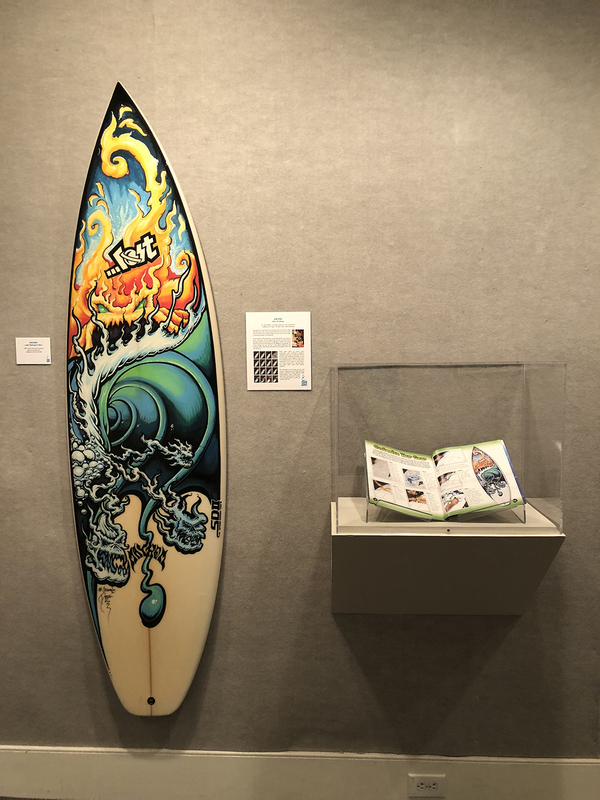 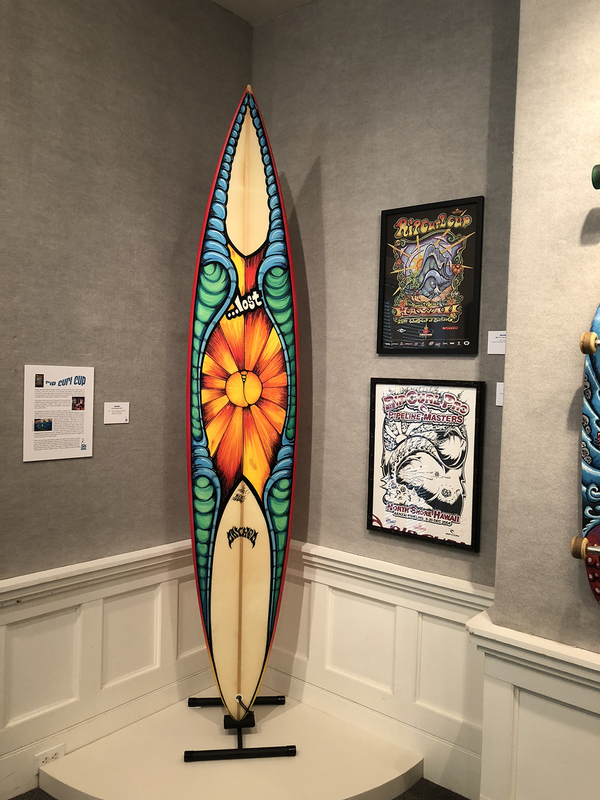 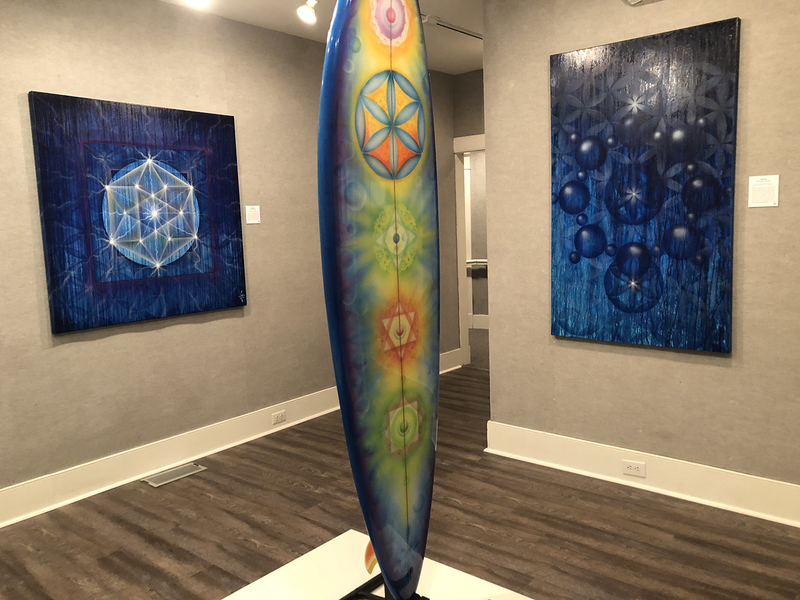 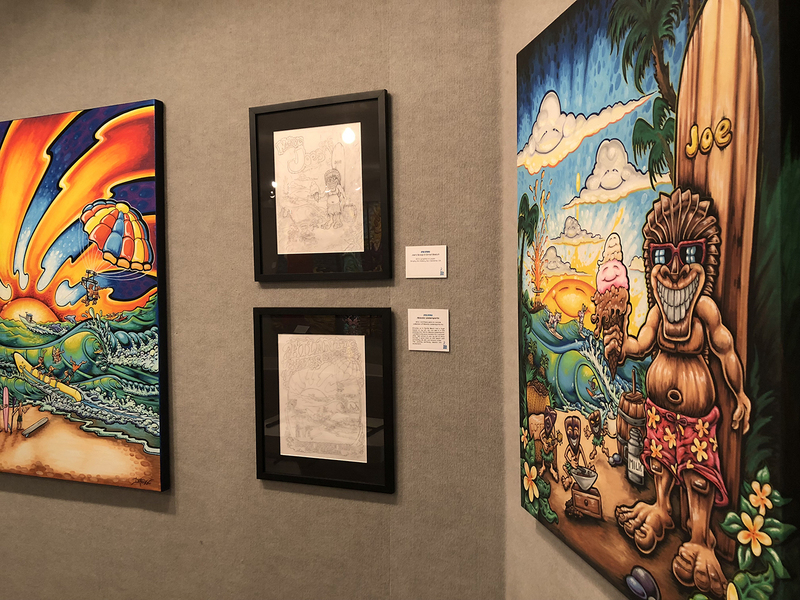 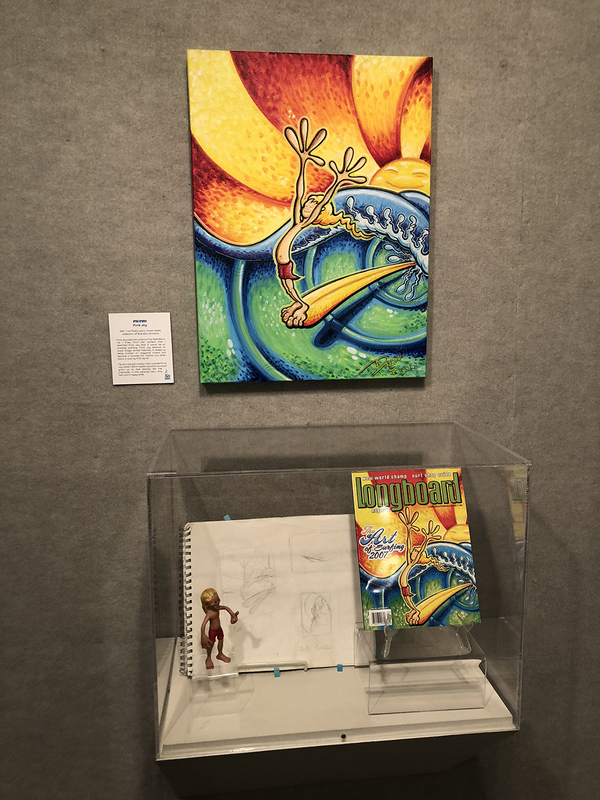 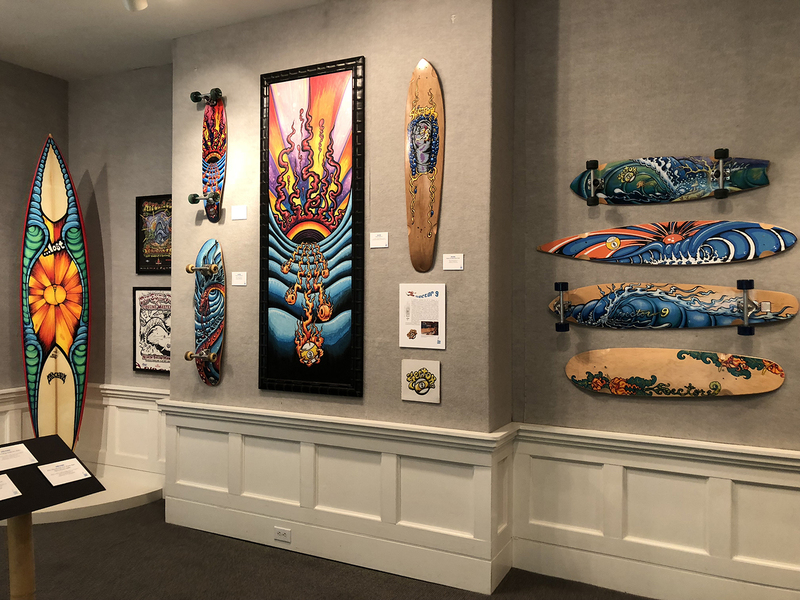 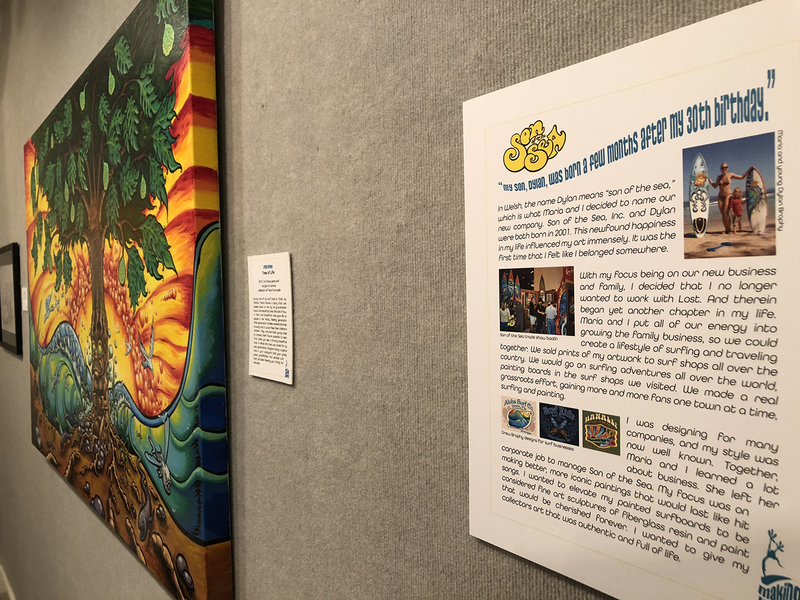 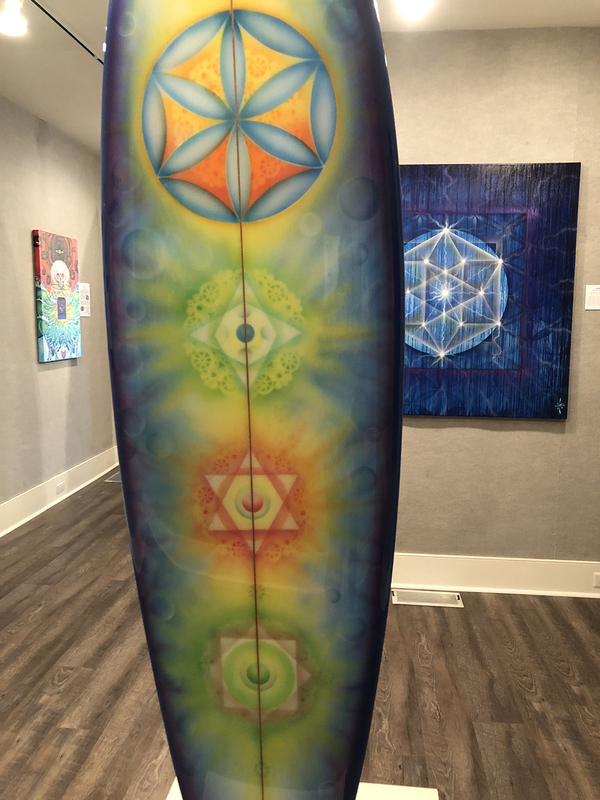 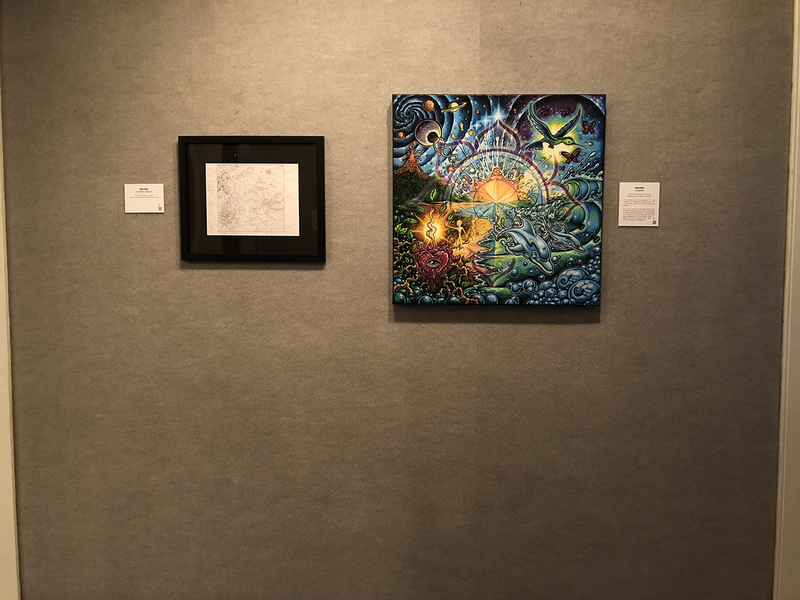 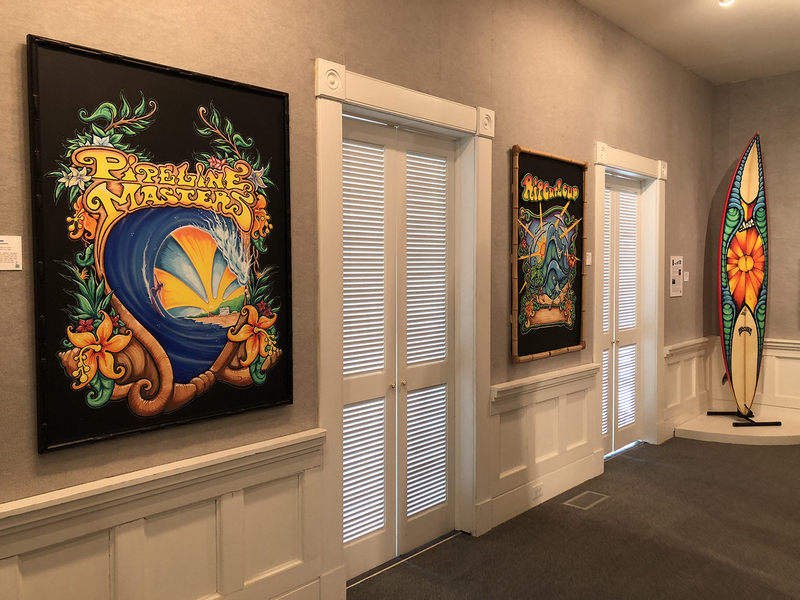 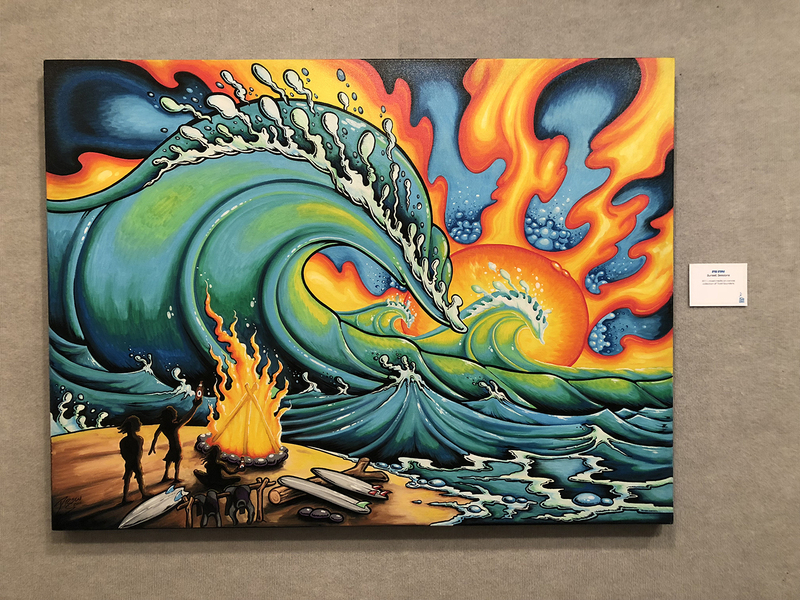 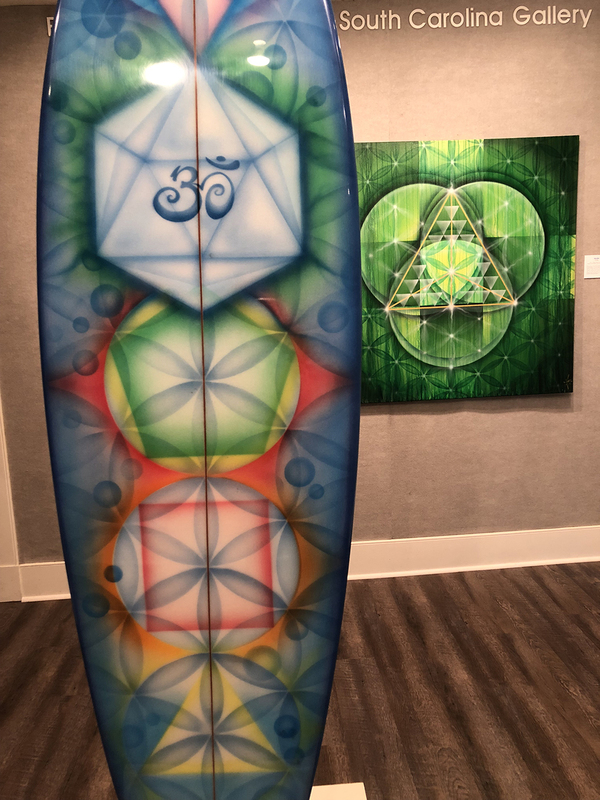 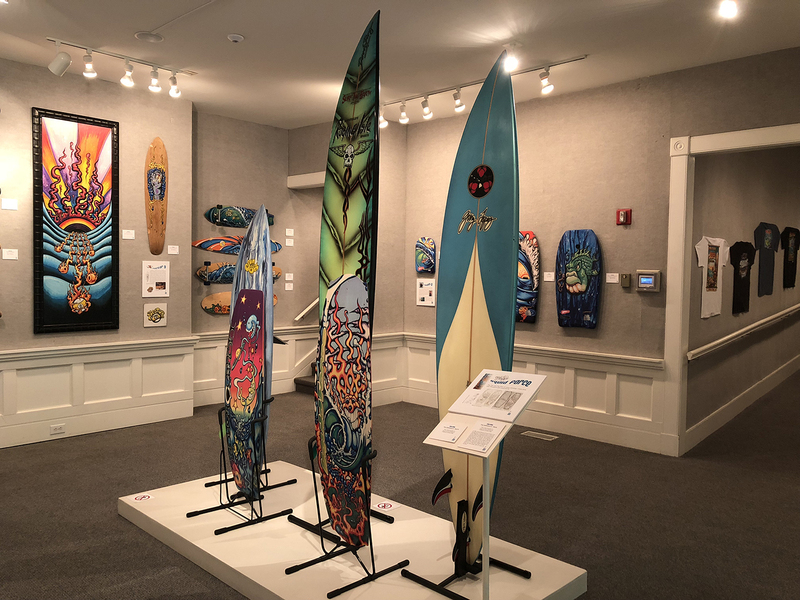 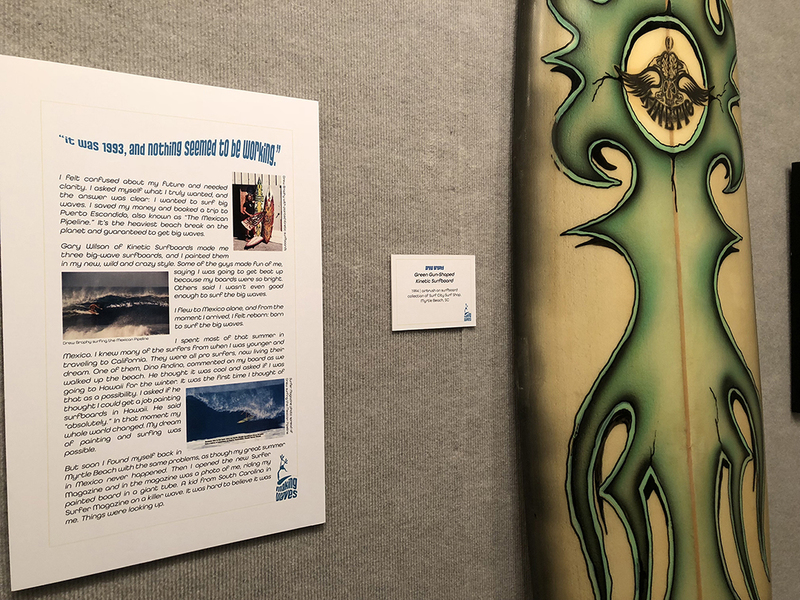 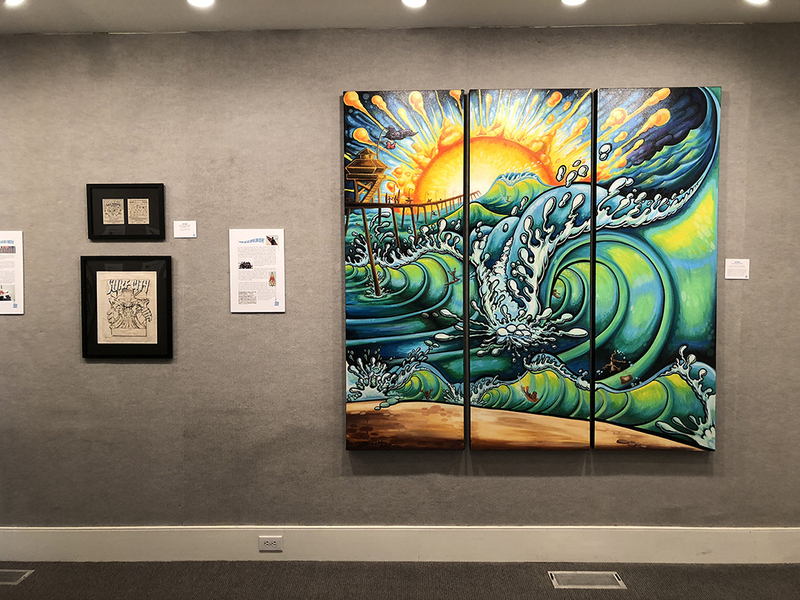 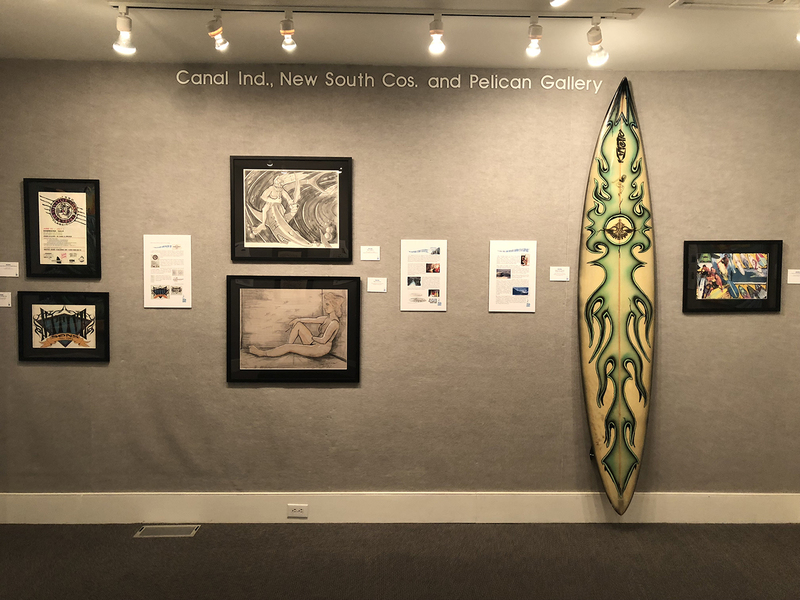 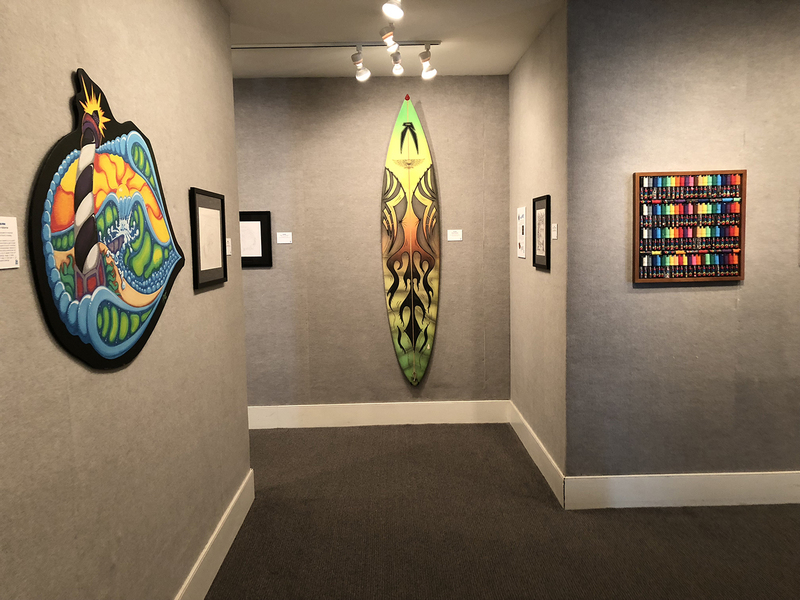 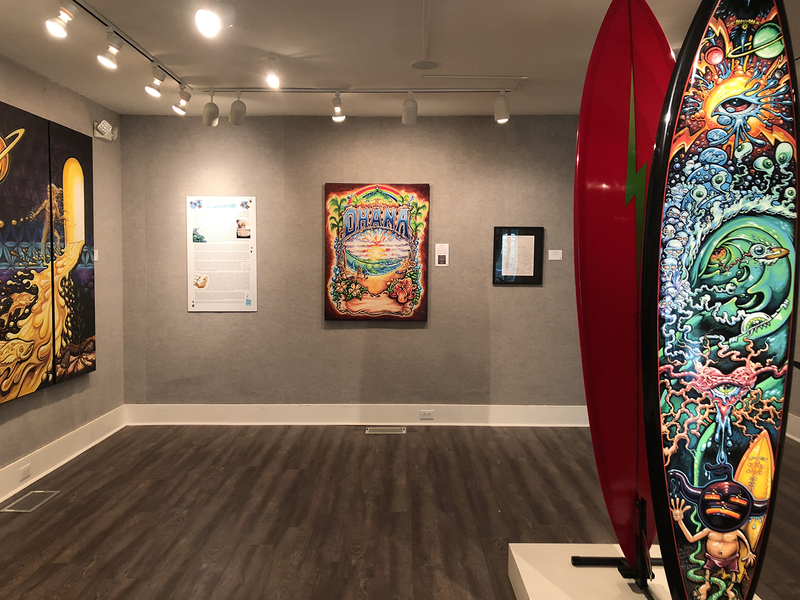 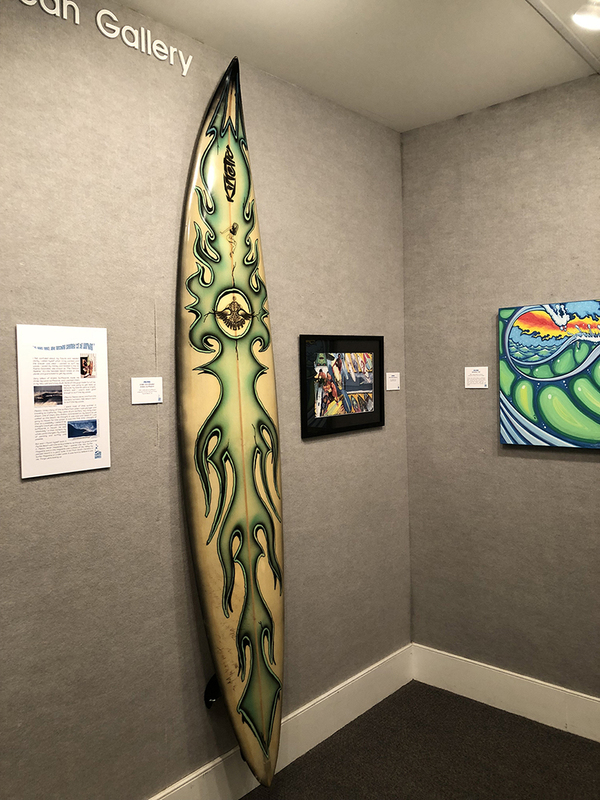 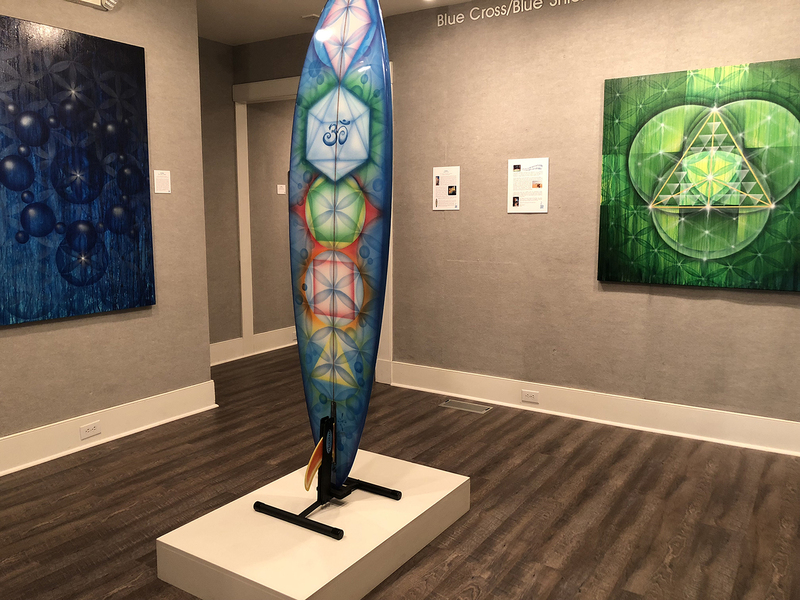 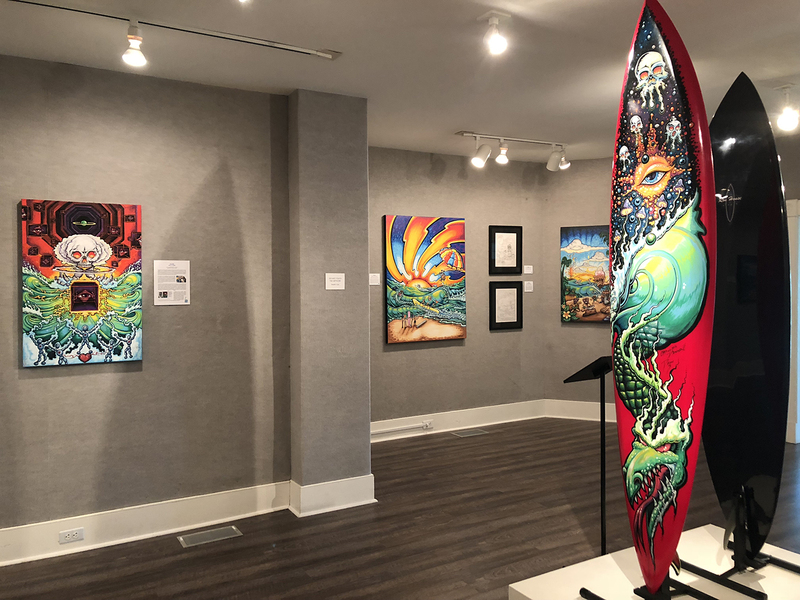 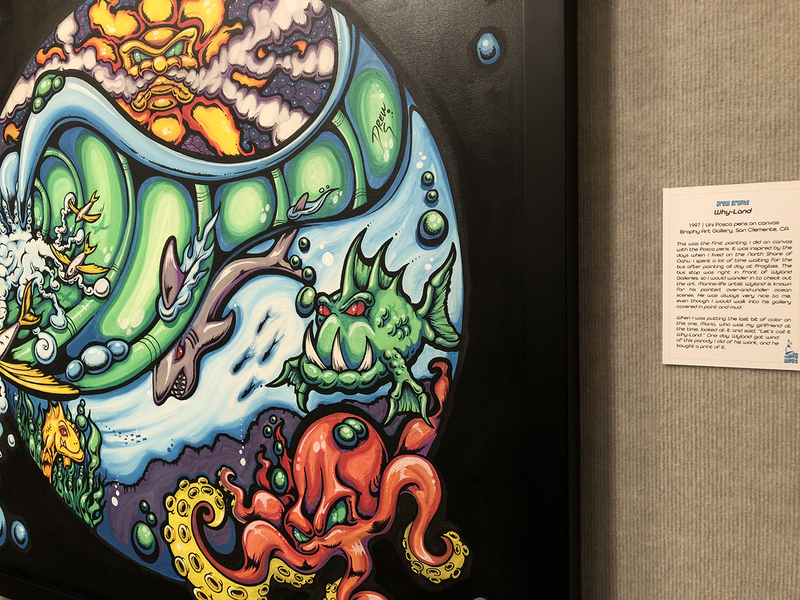 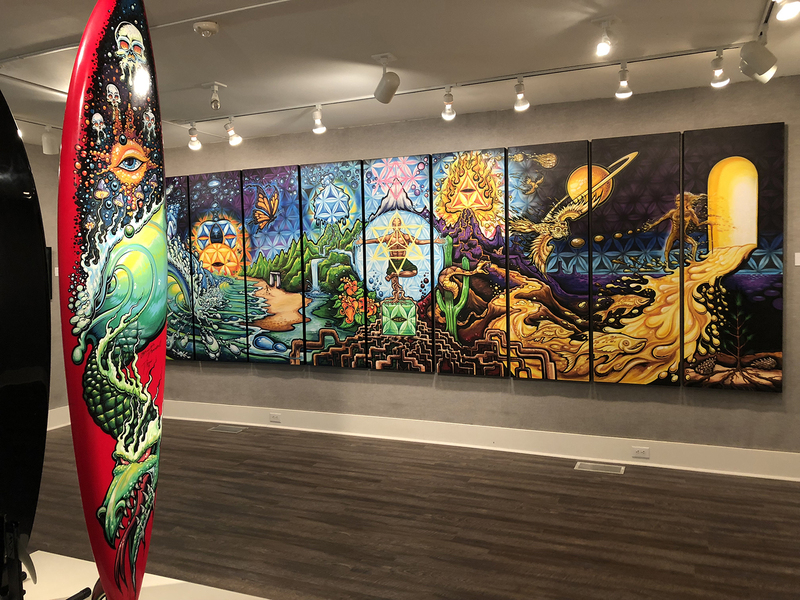 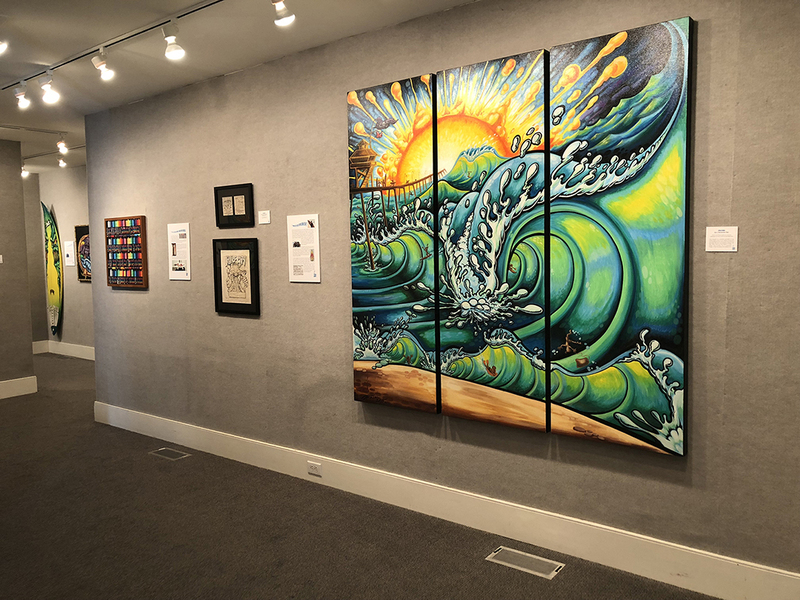 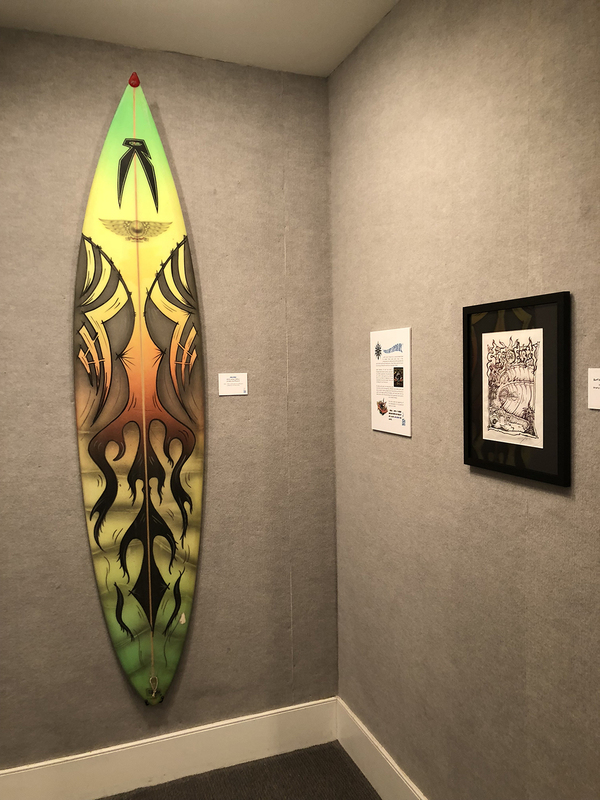 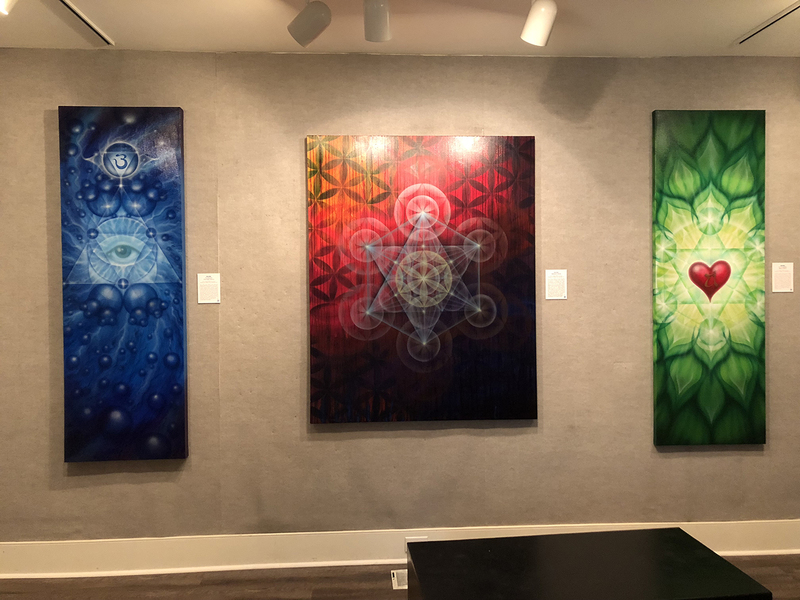 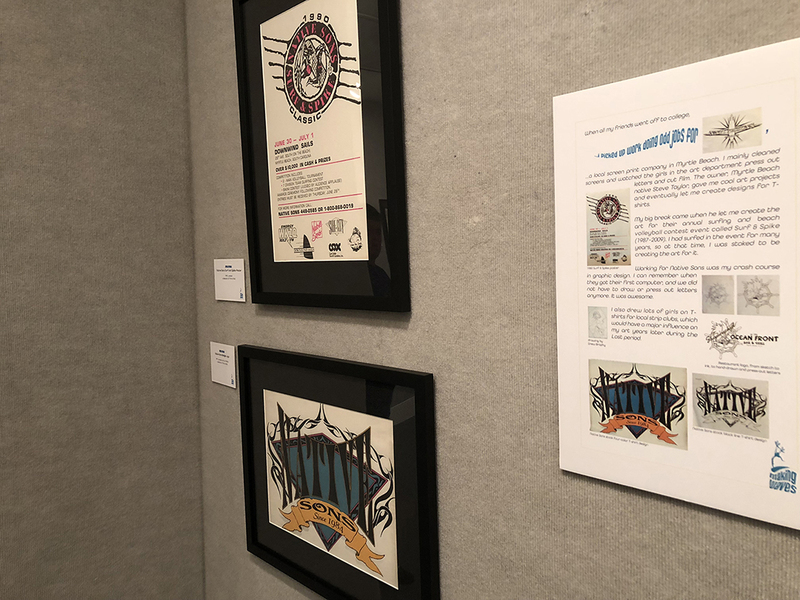 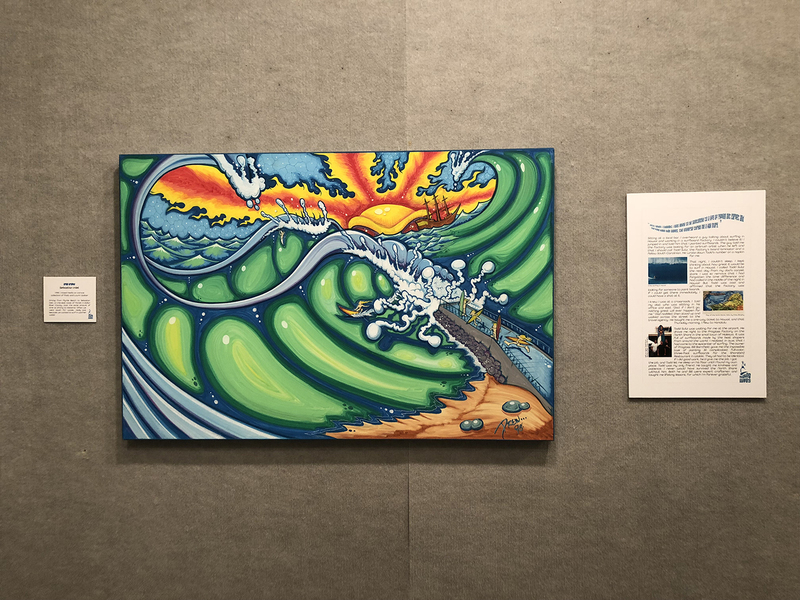 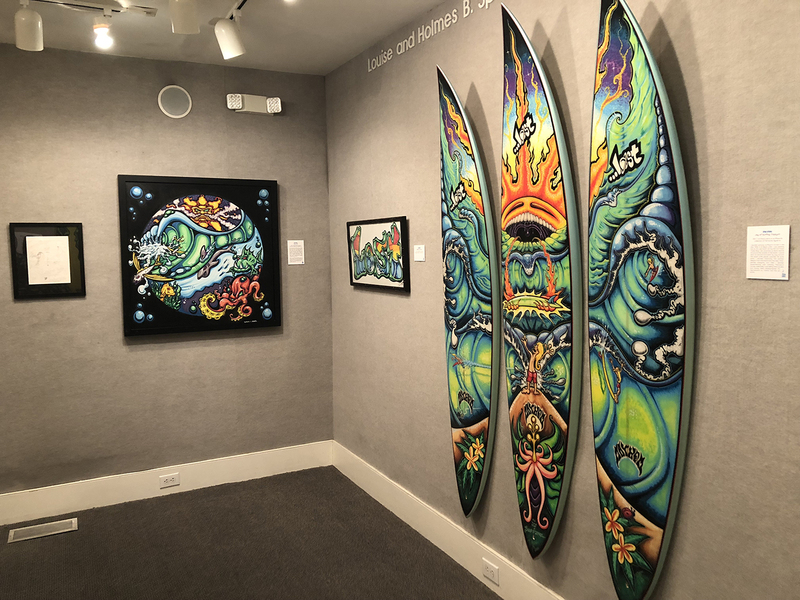 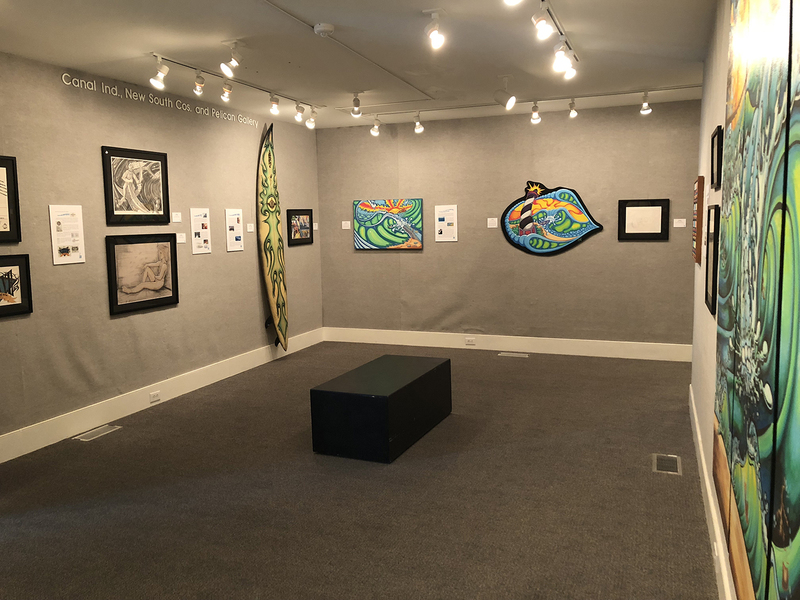 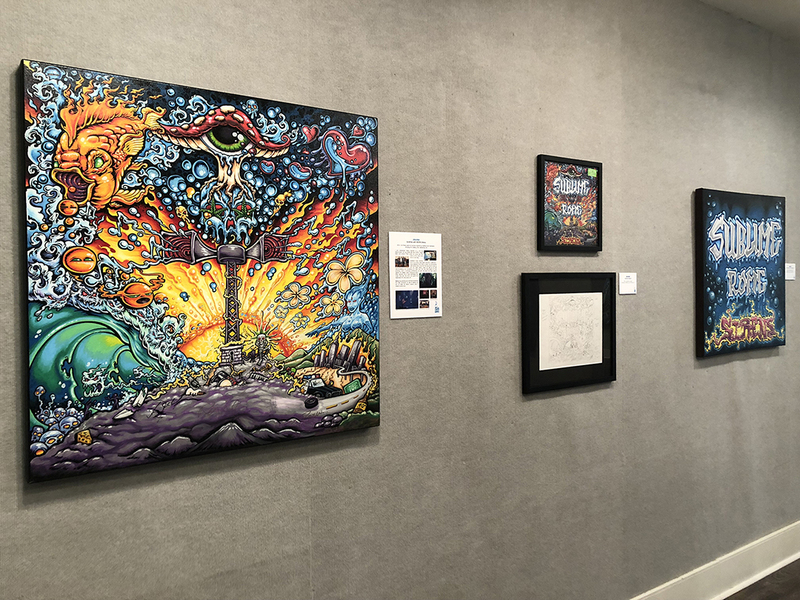 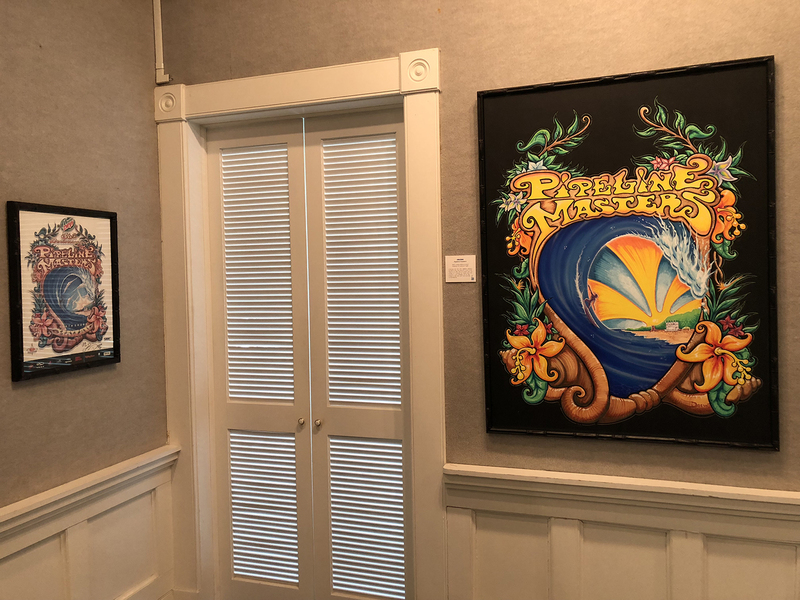 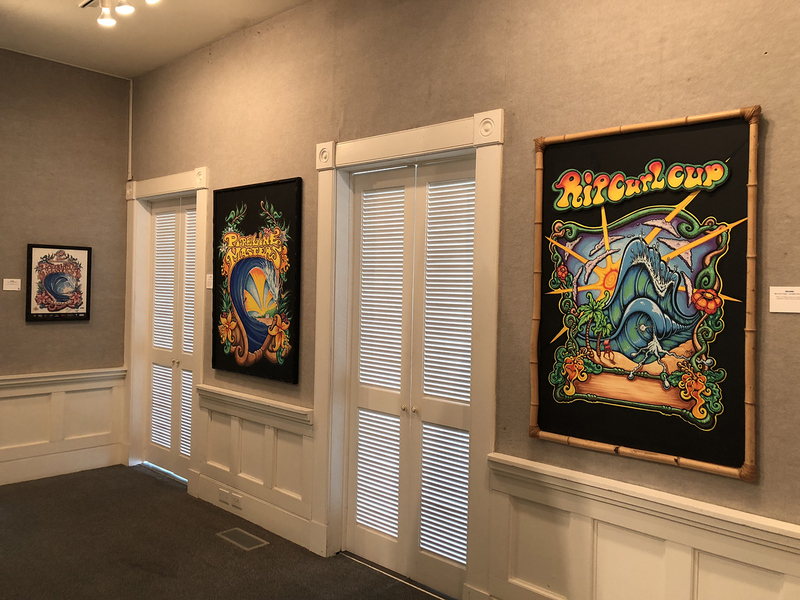 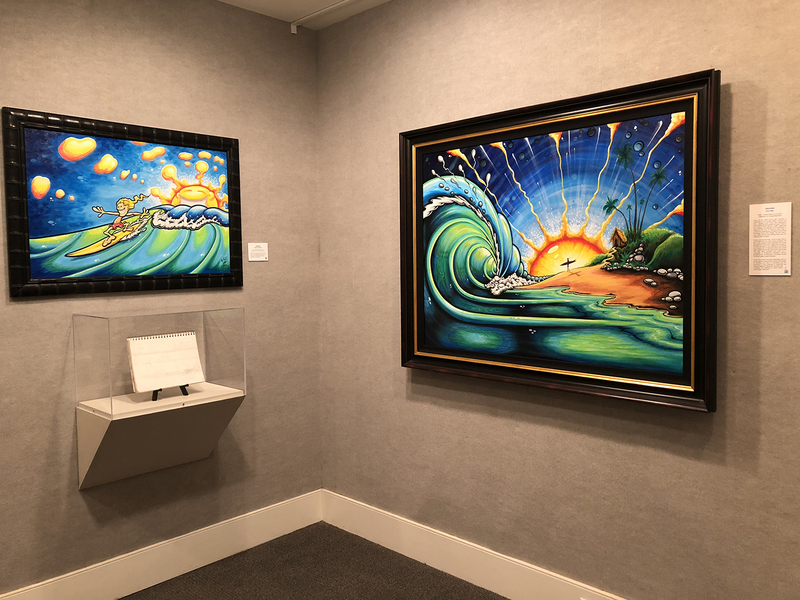 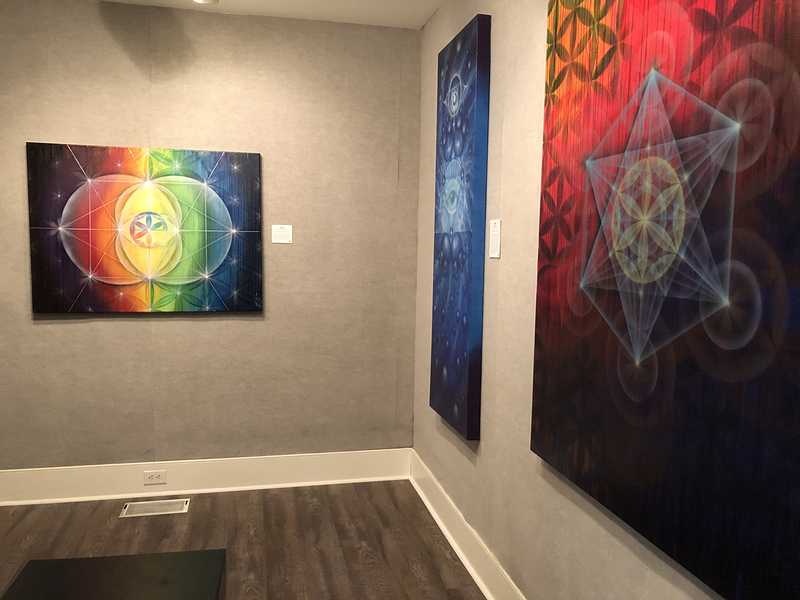 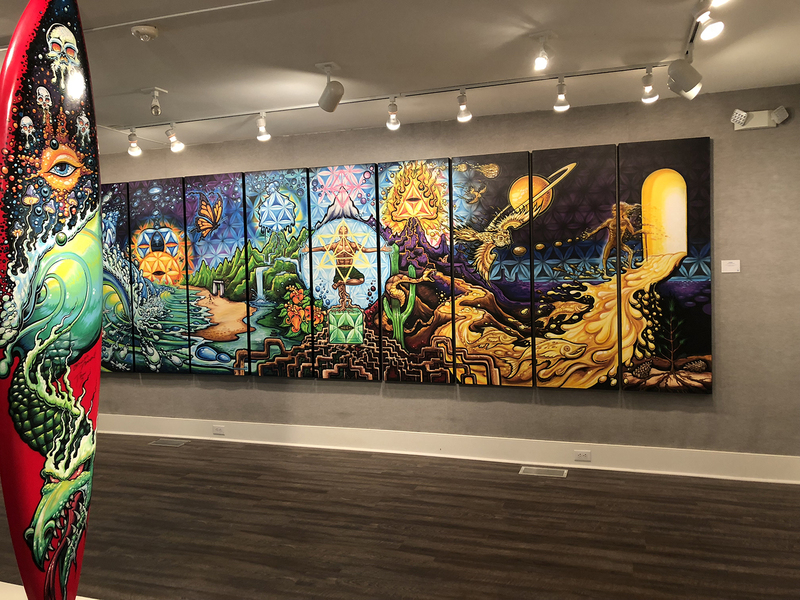 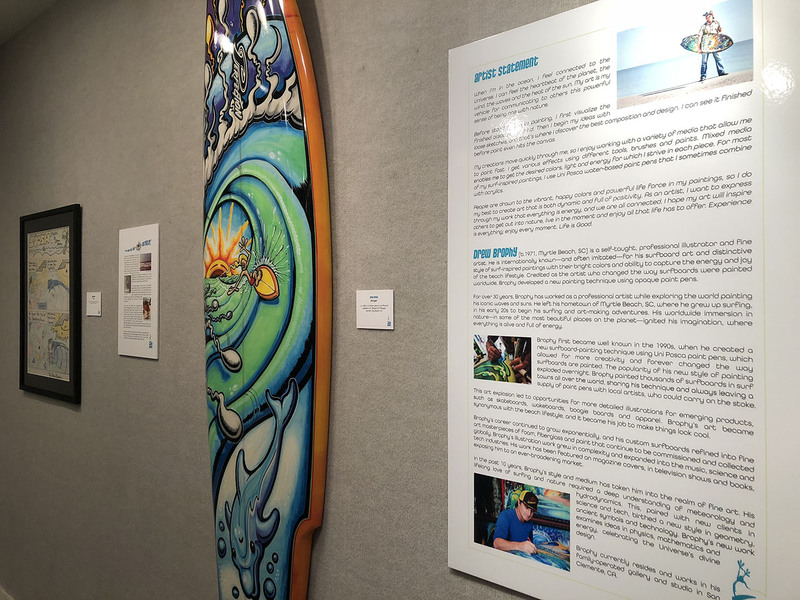 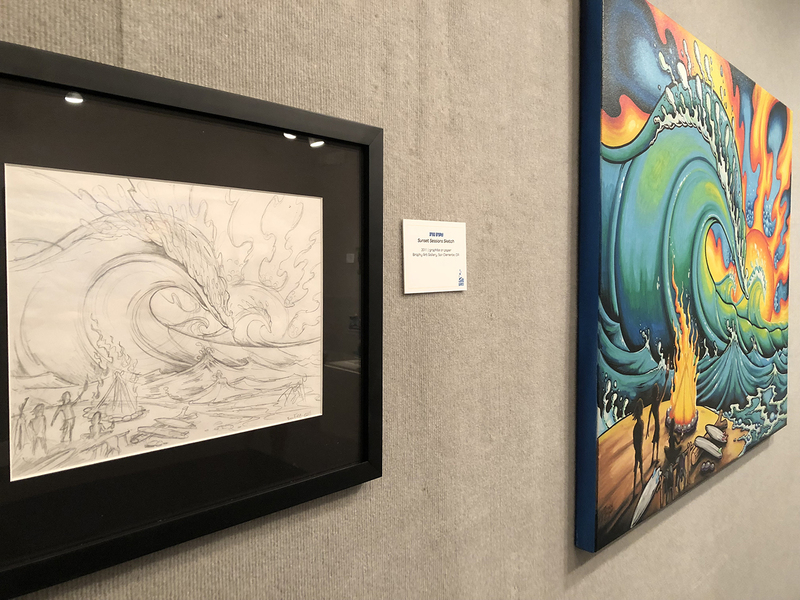 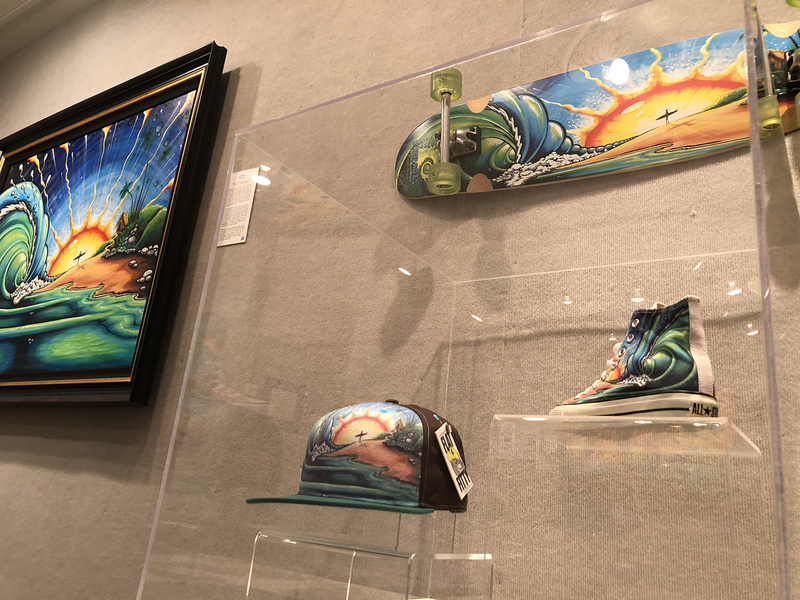 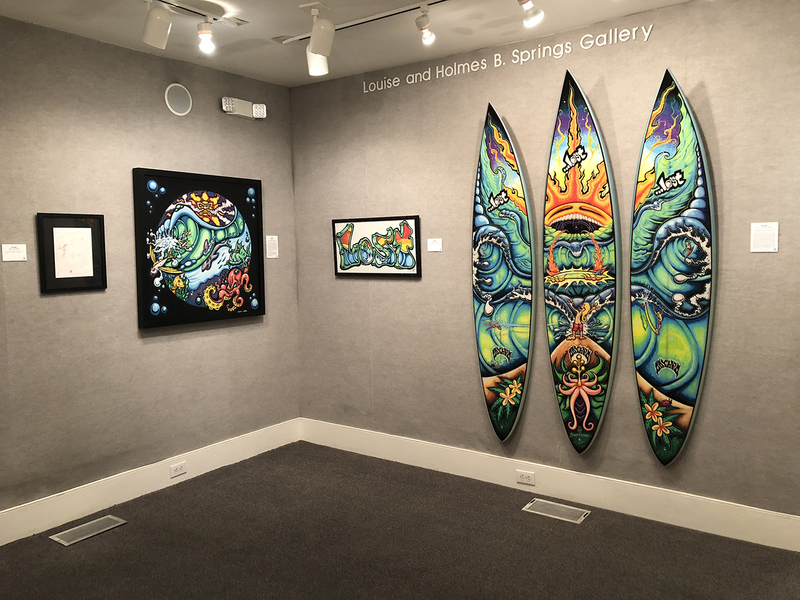 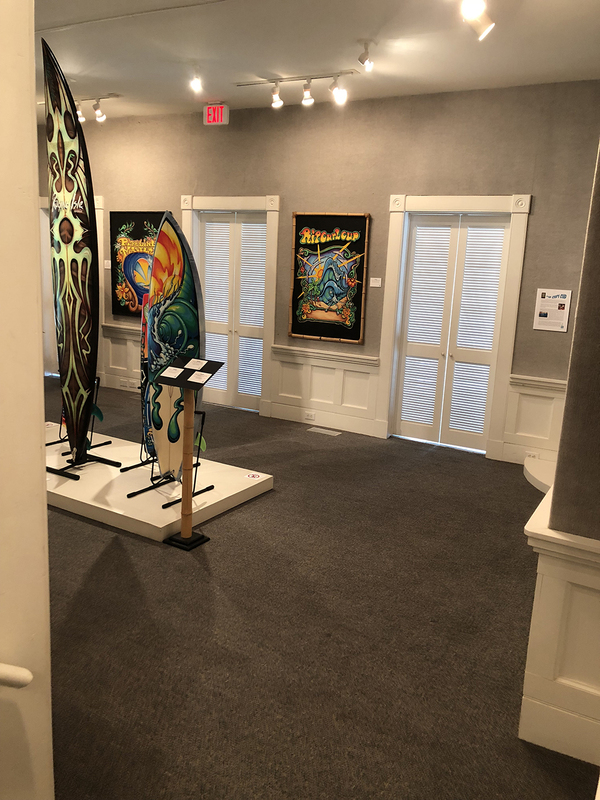 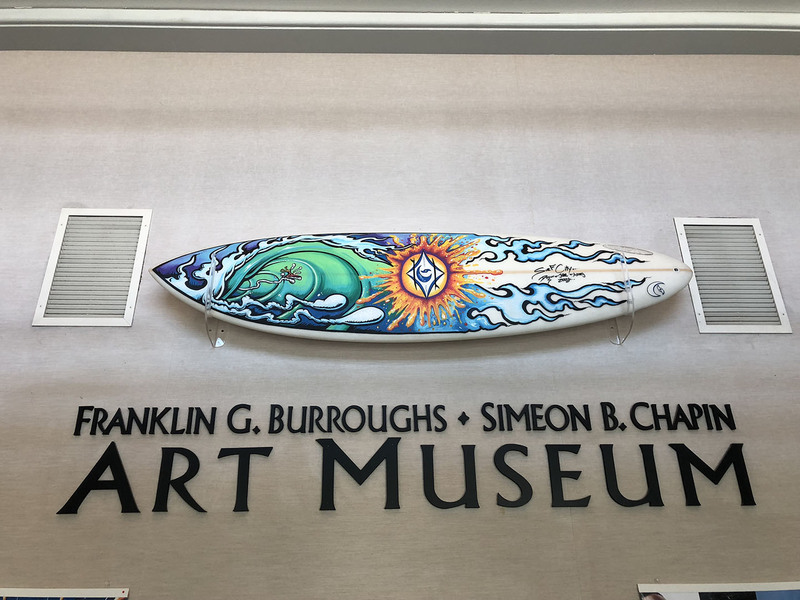 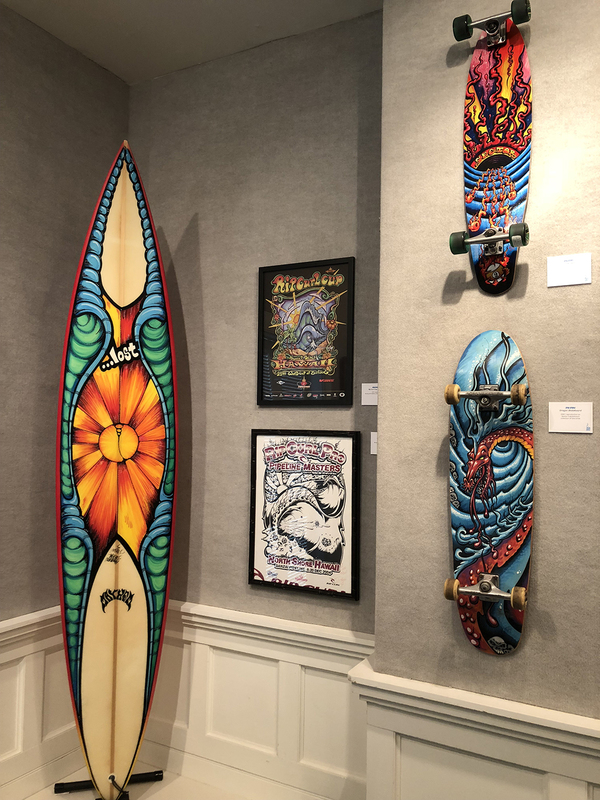 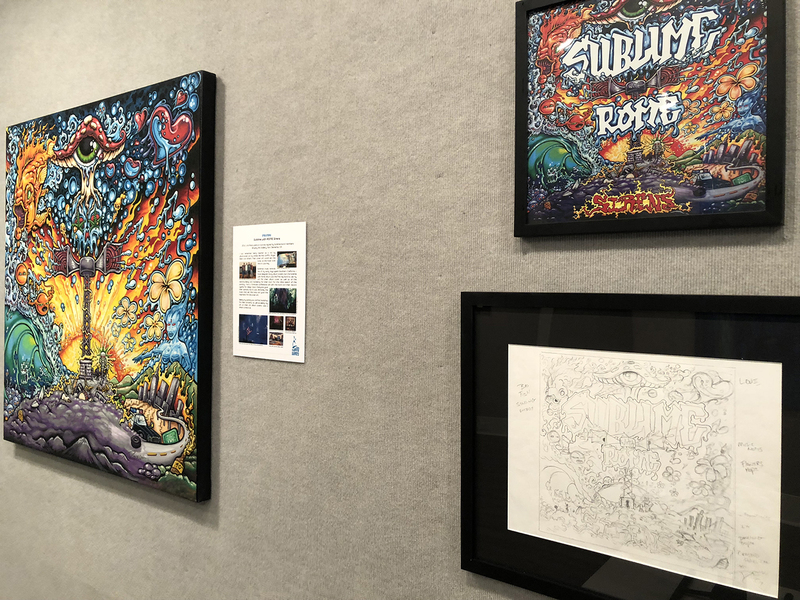 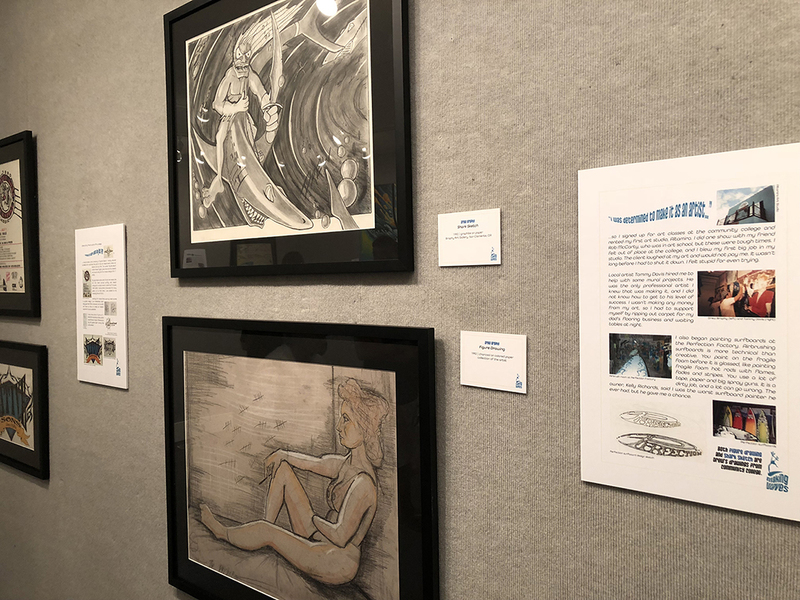 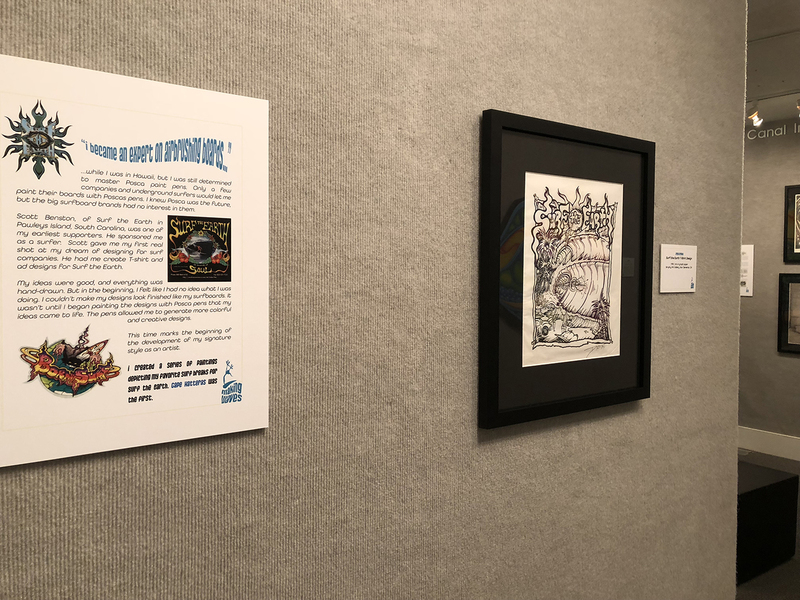 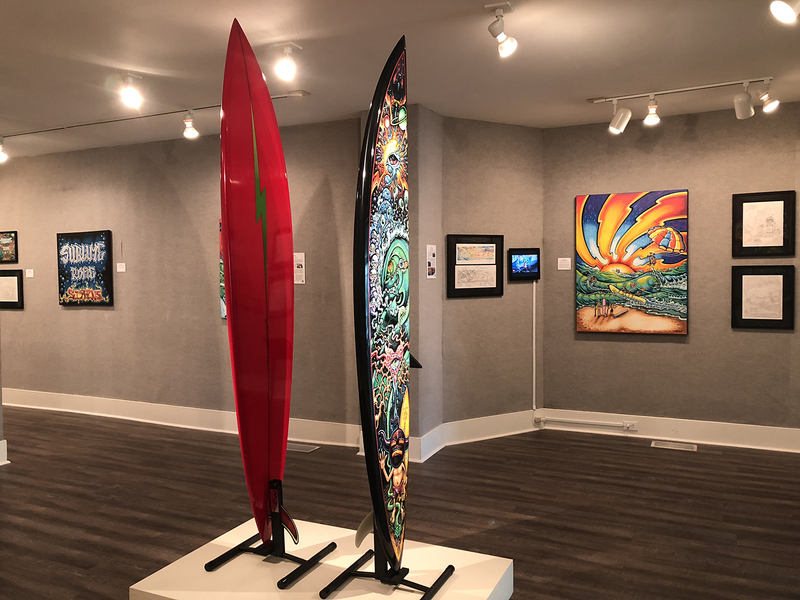 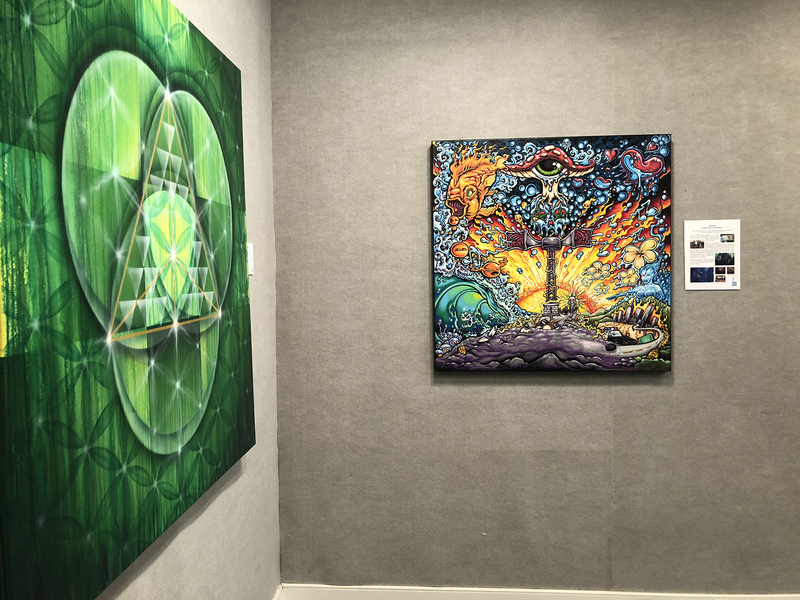 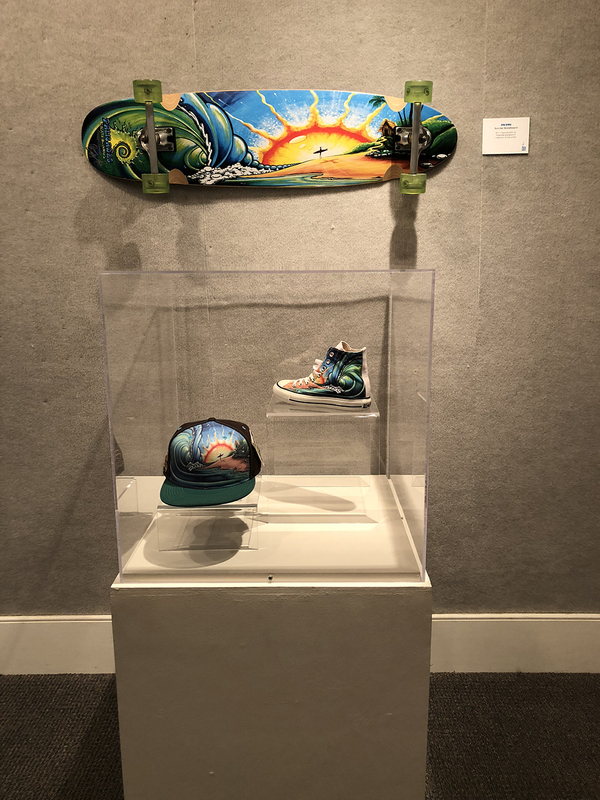 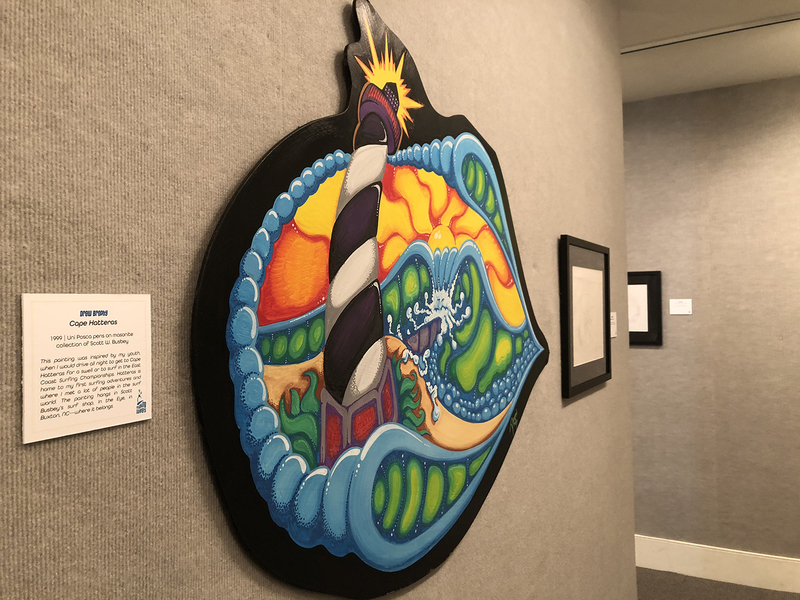 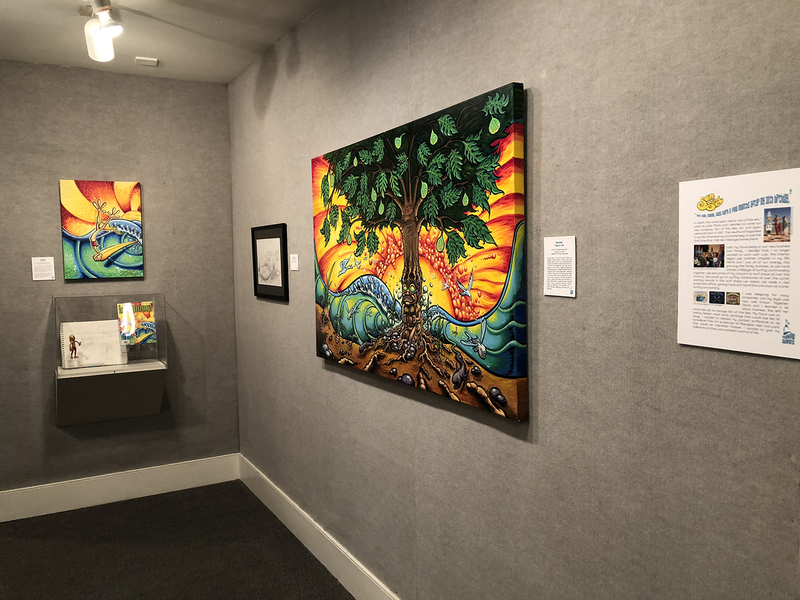 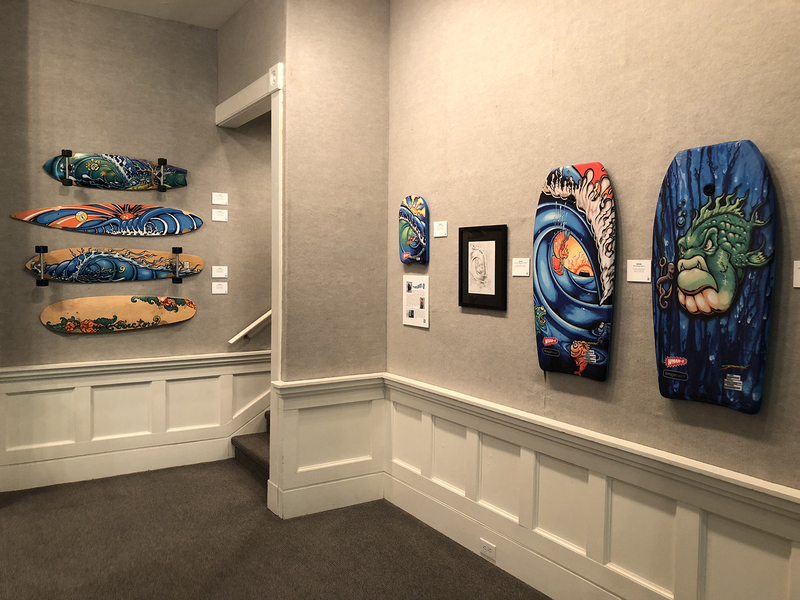 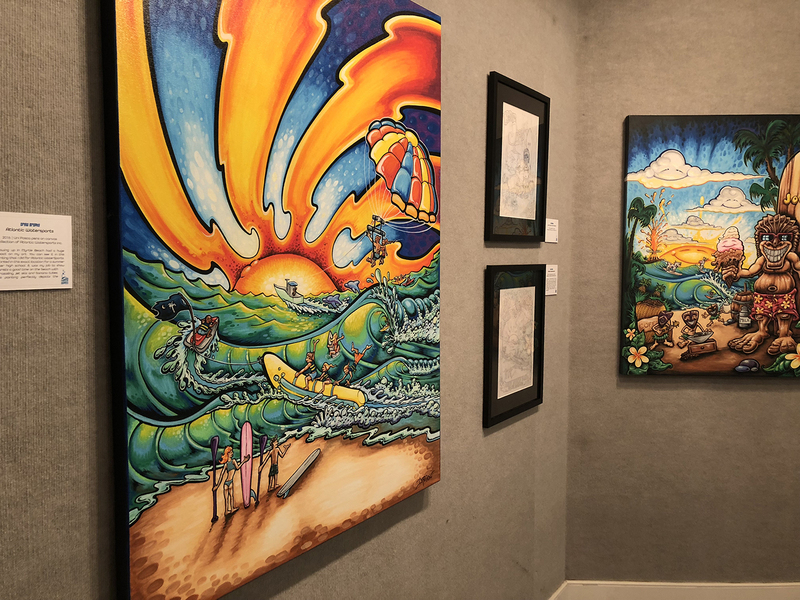 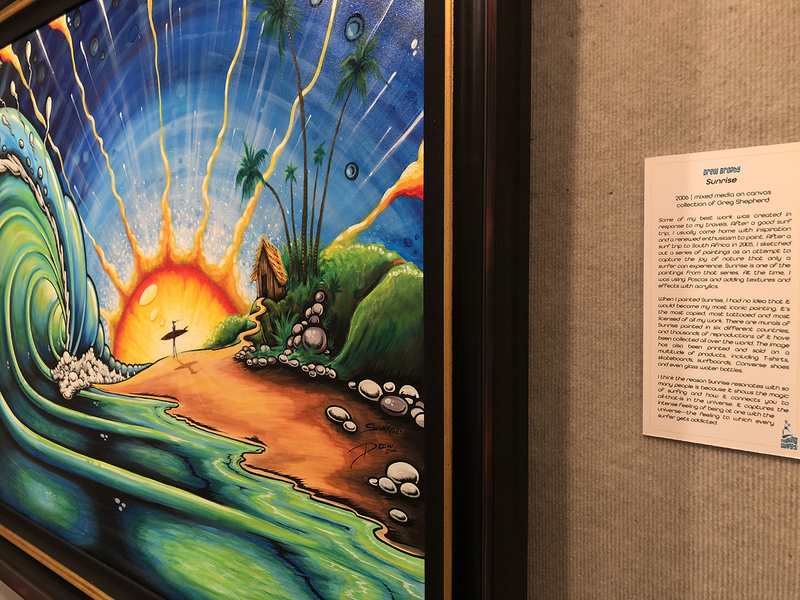 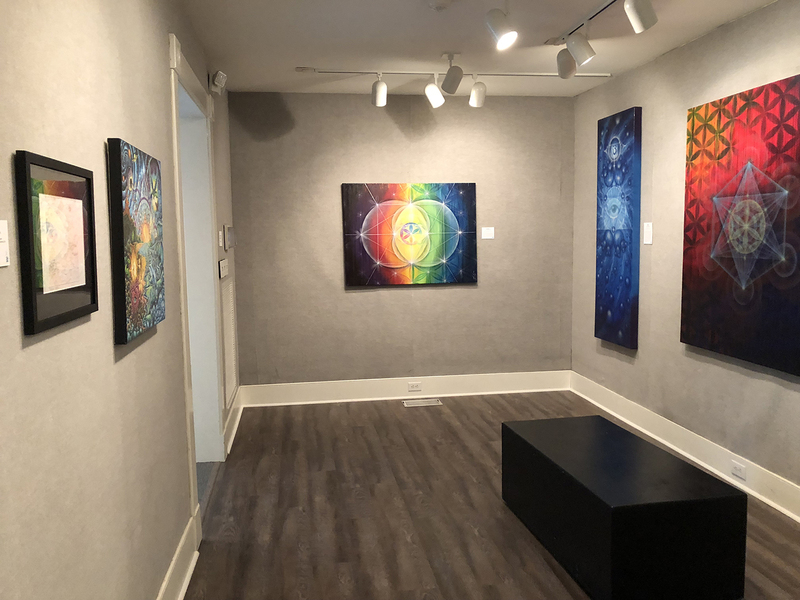 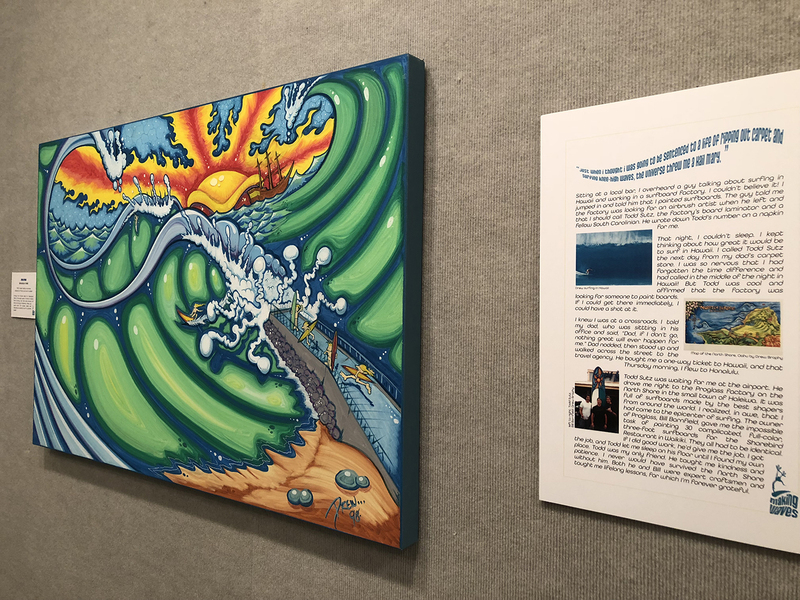 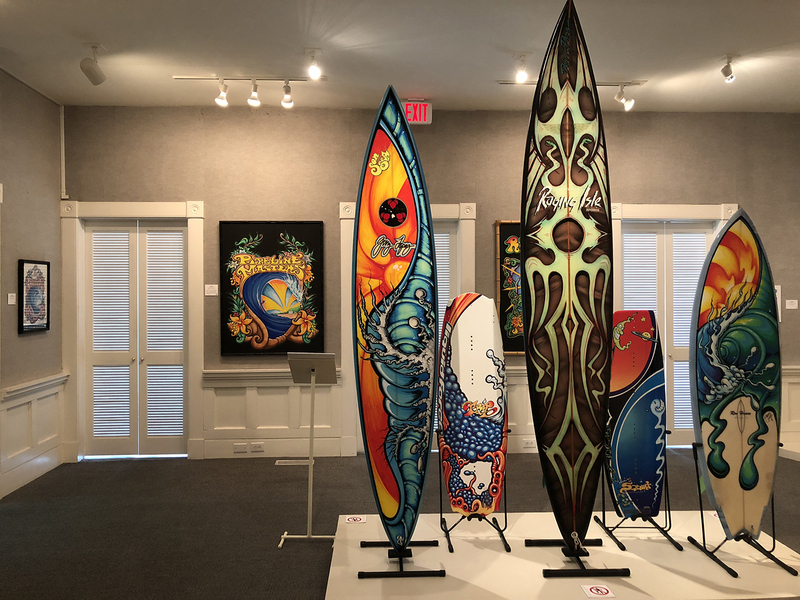 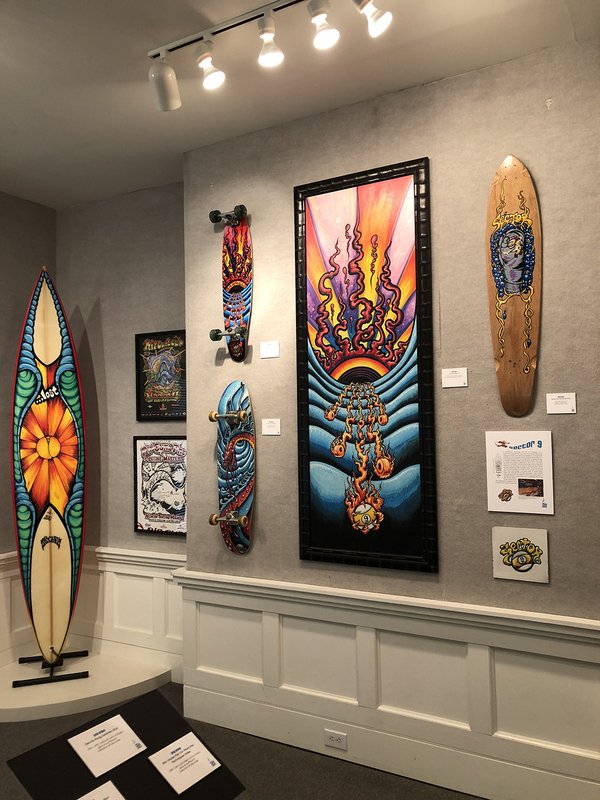 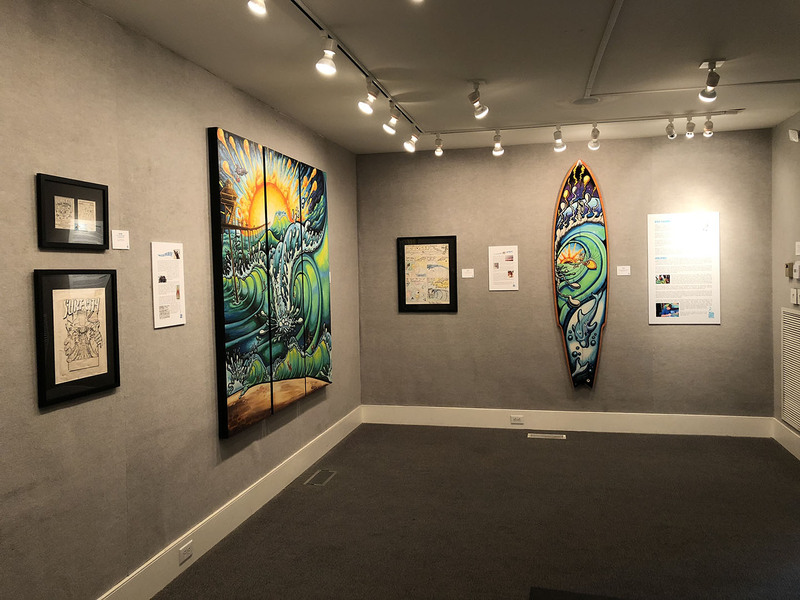 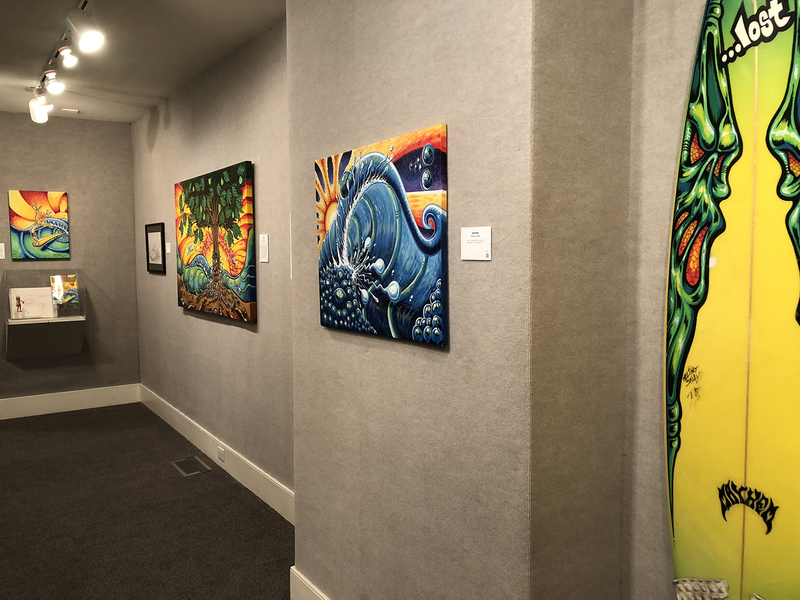 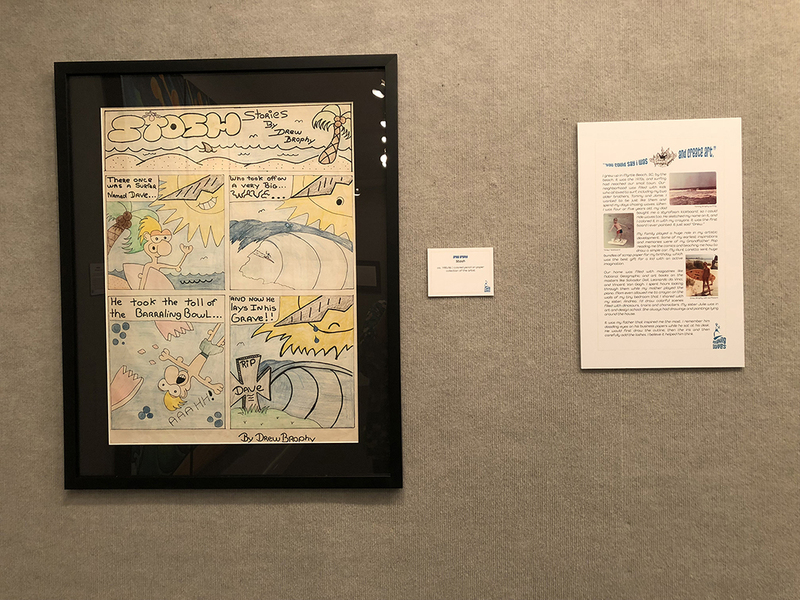 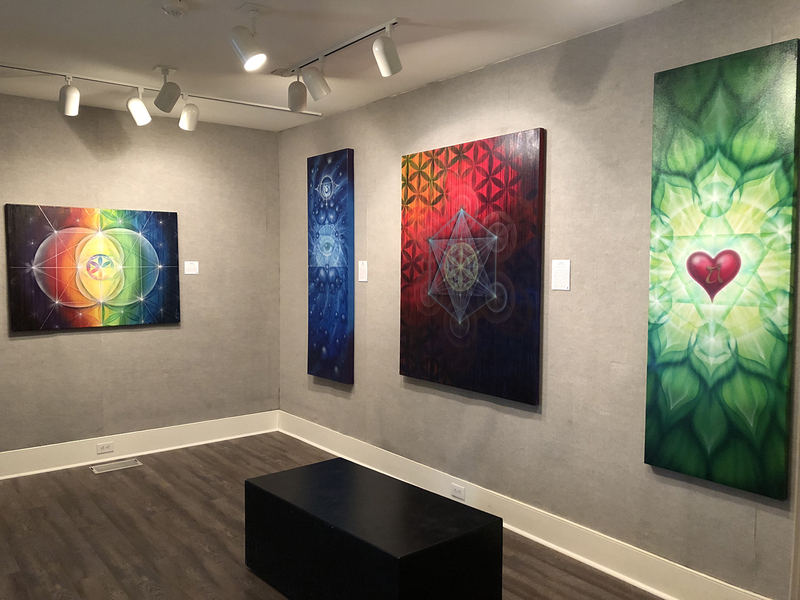 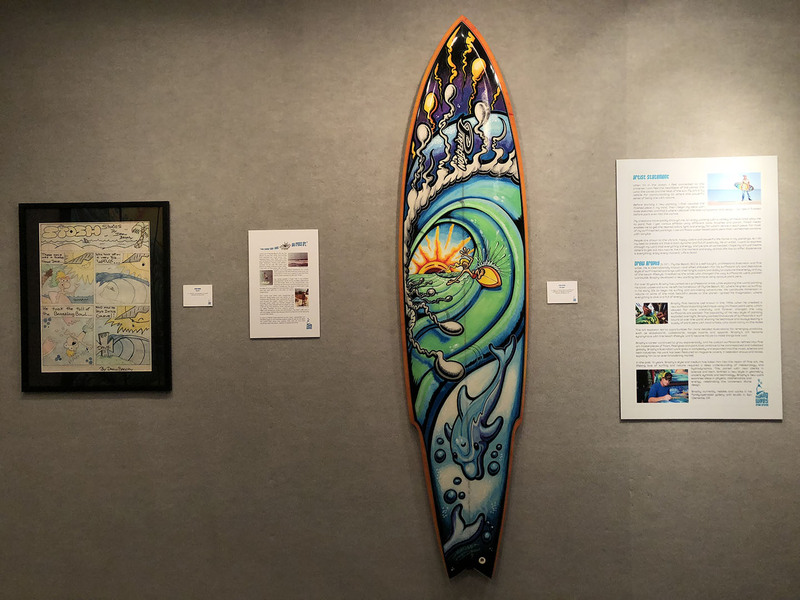 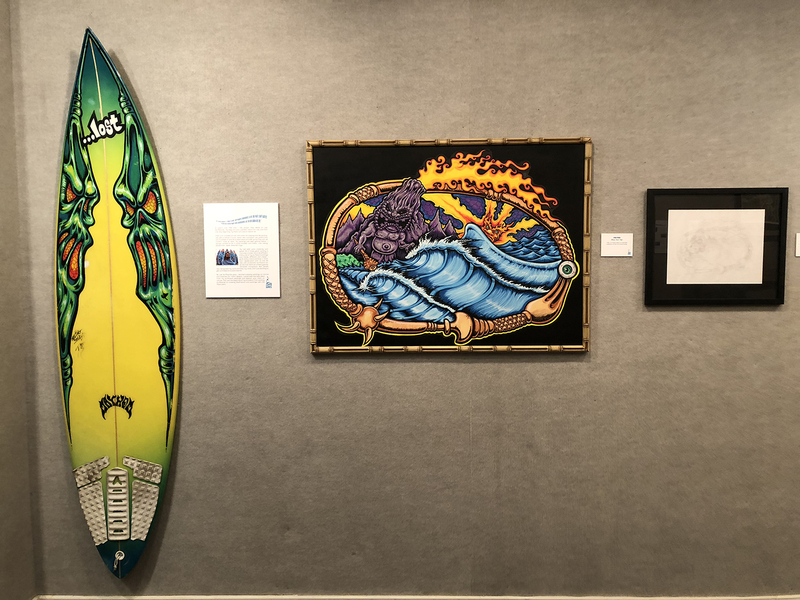 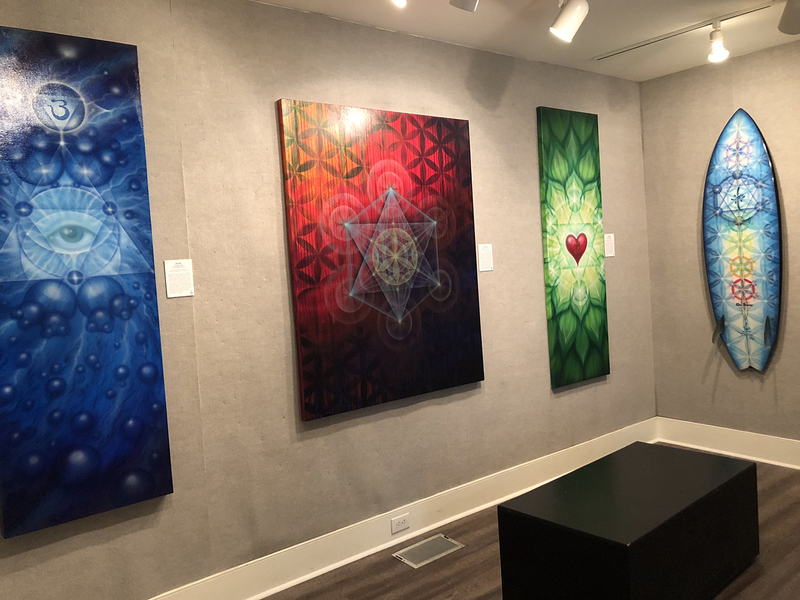 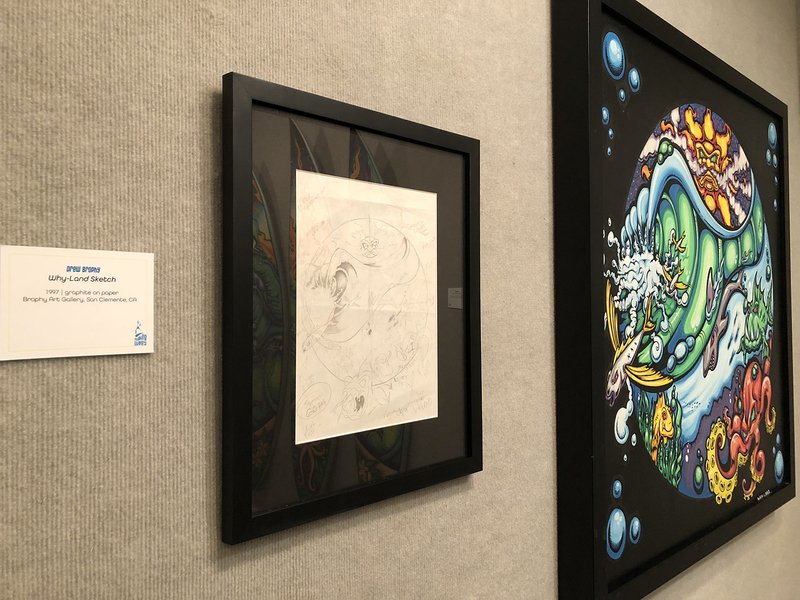 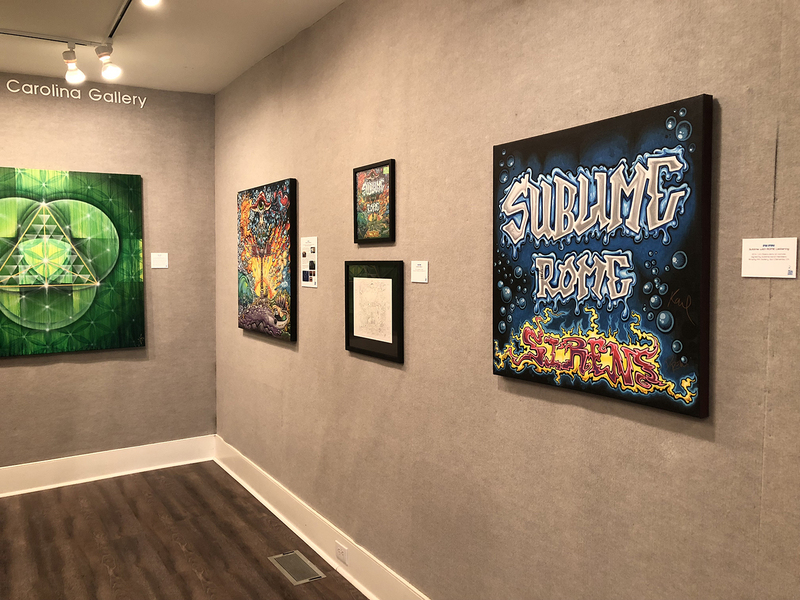 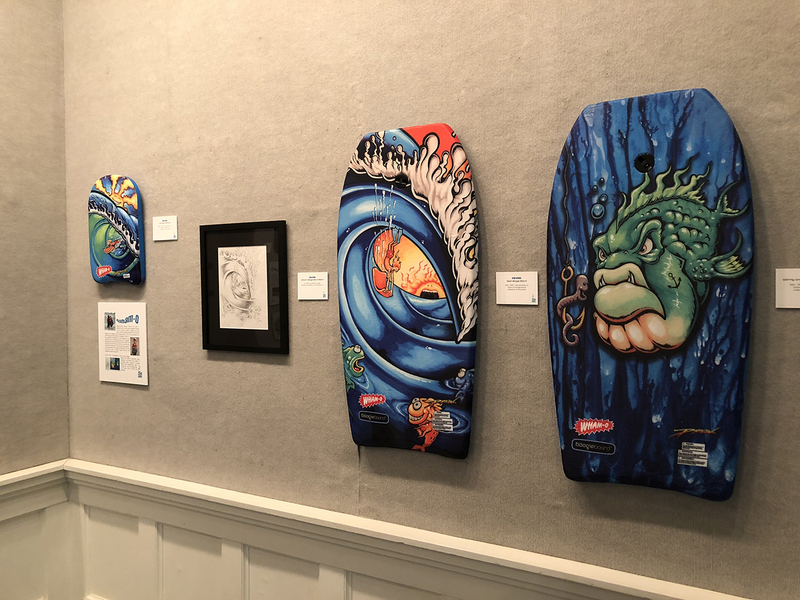 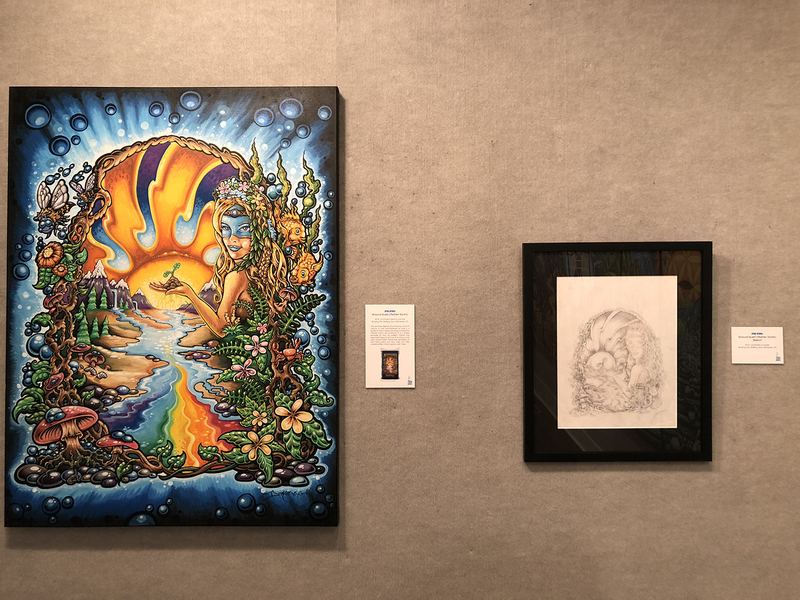 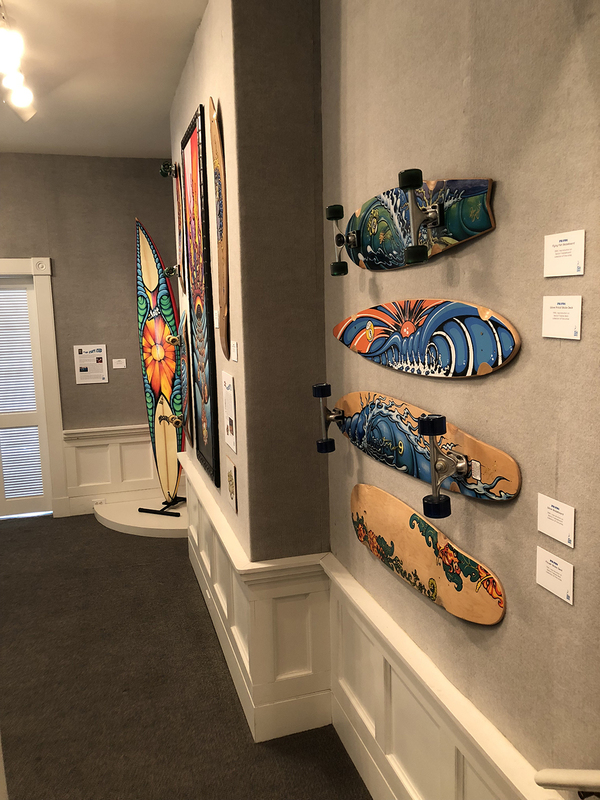 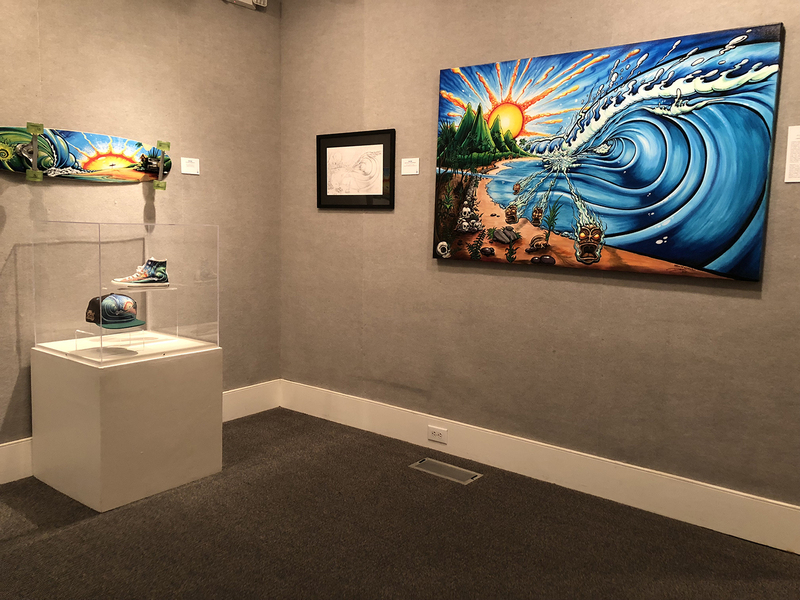 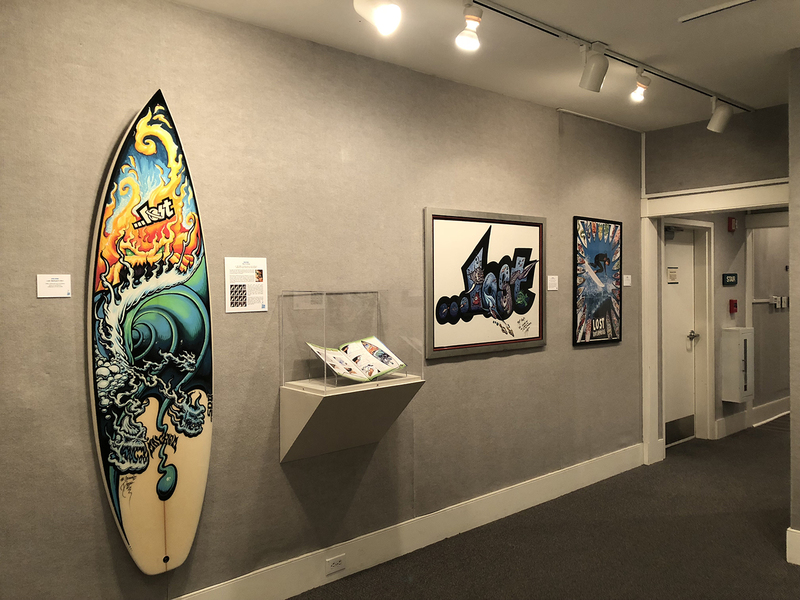 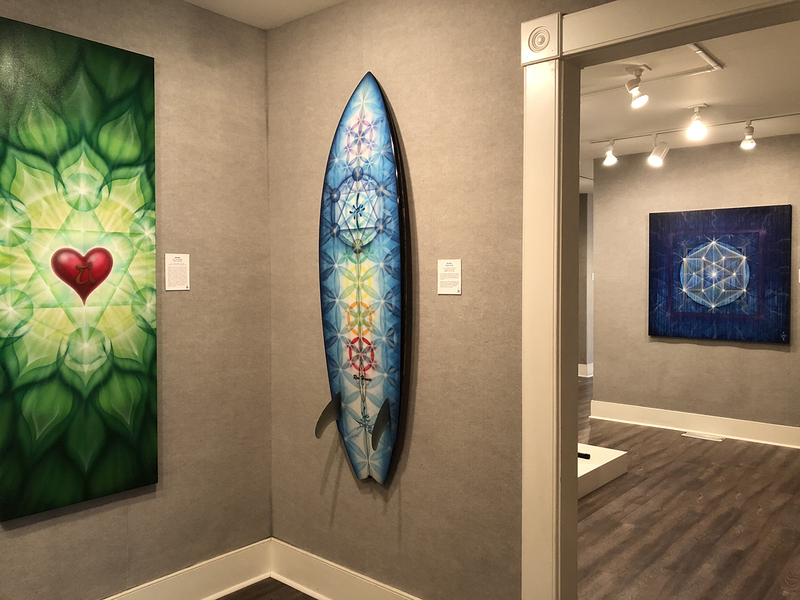 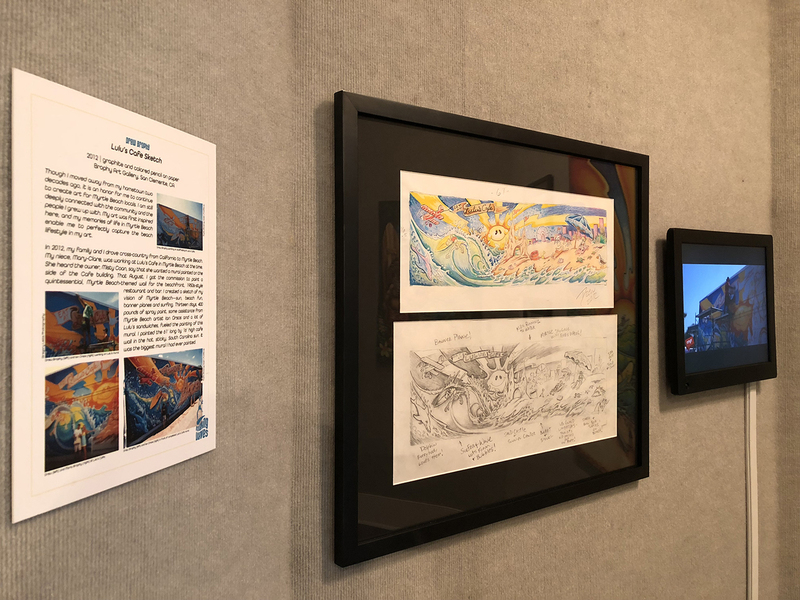 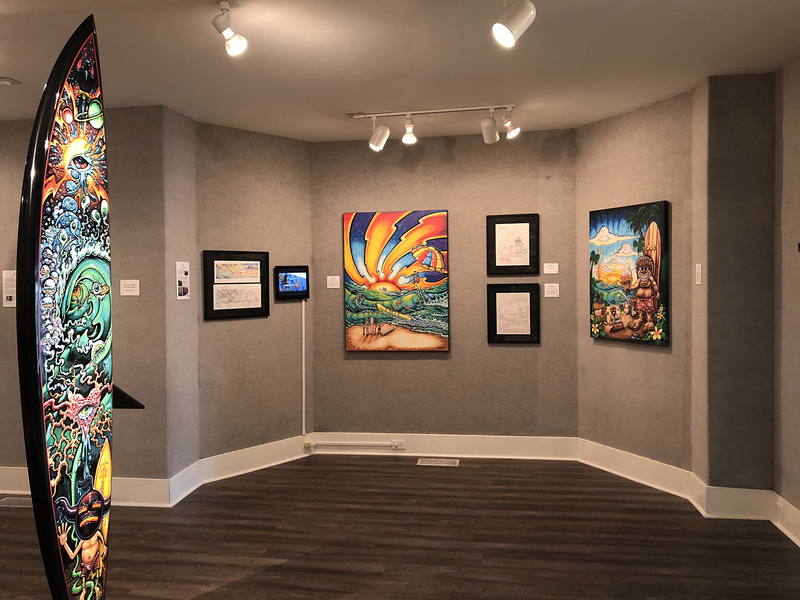 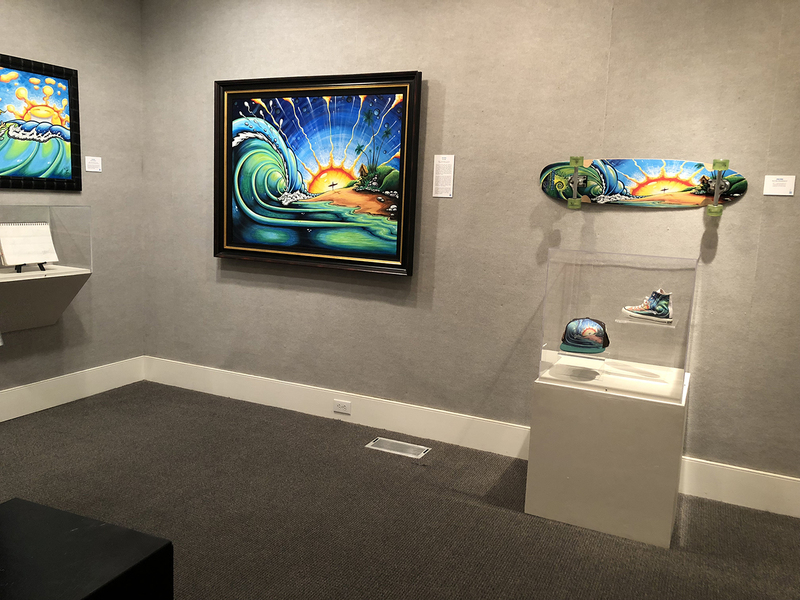 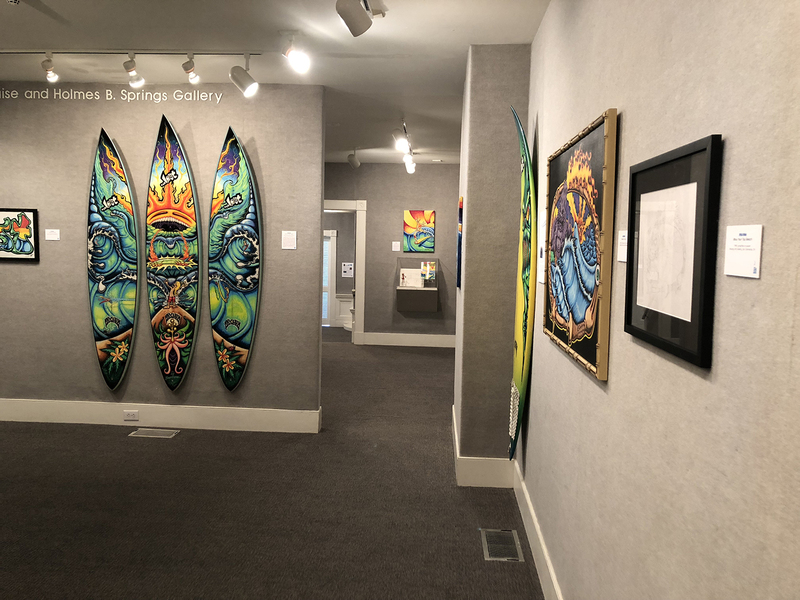 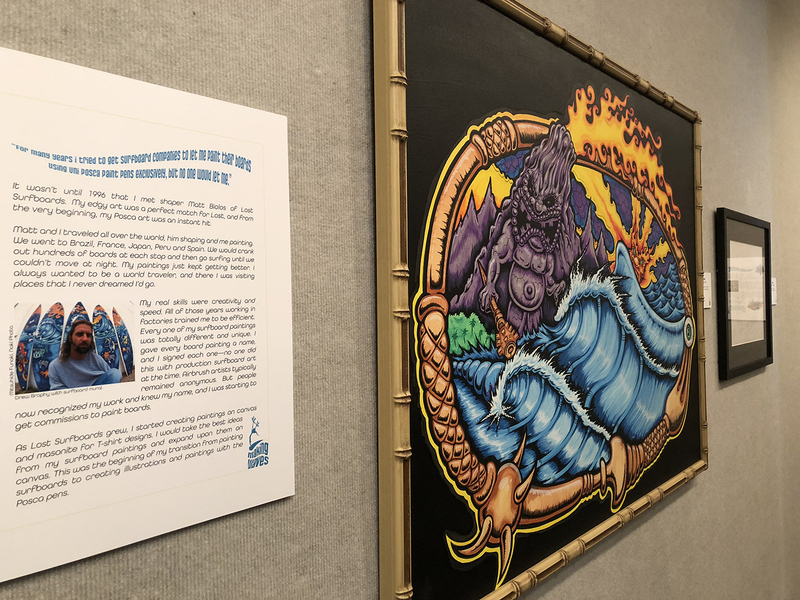 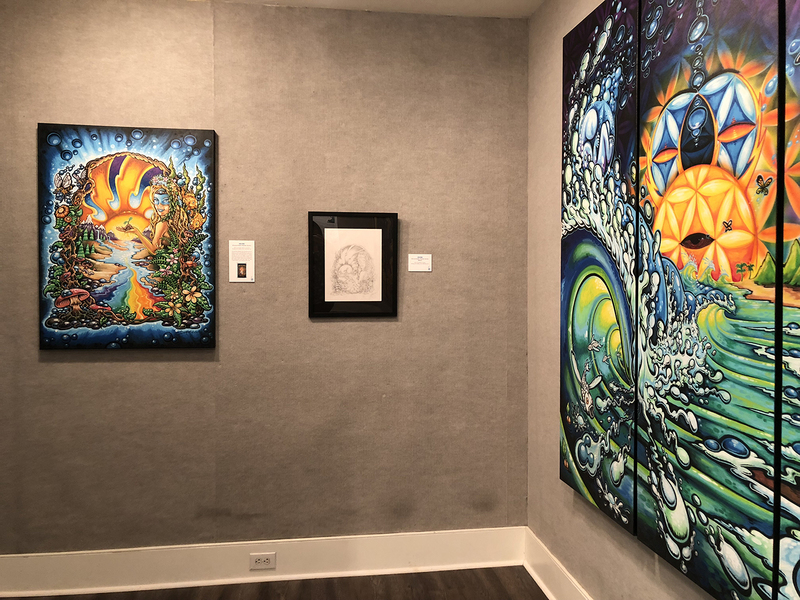 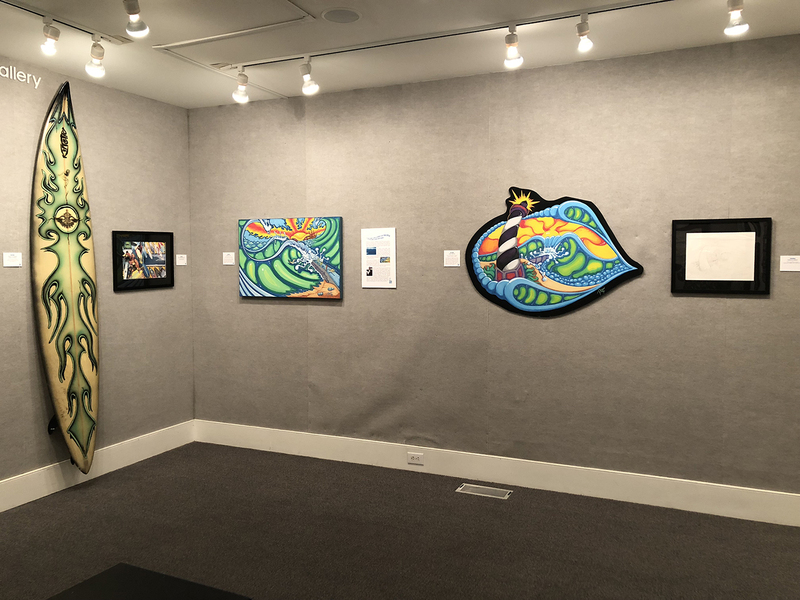 Thank you from the bottom of my heart for lending your paintings and painted surfboards for Drew Brophy’s retrospective exhibit here at the Art Museum in Myrtle Beach, SC. 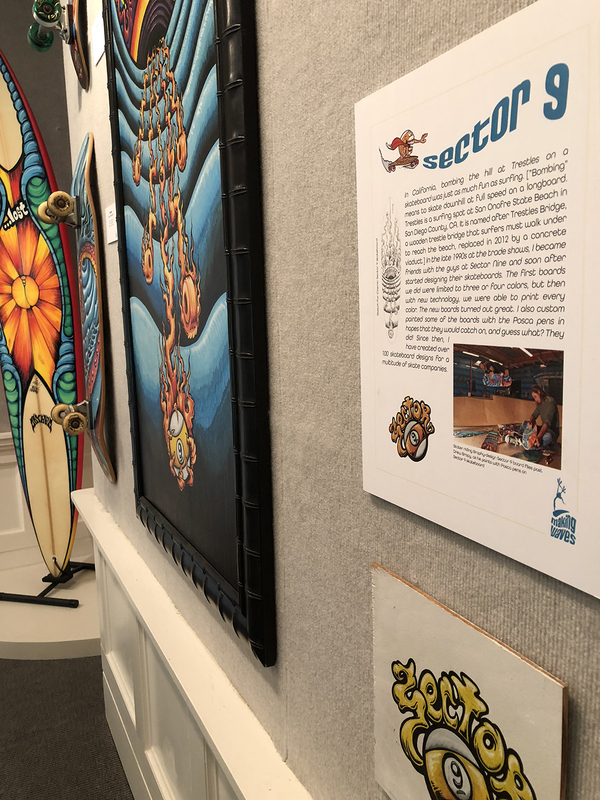 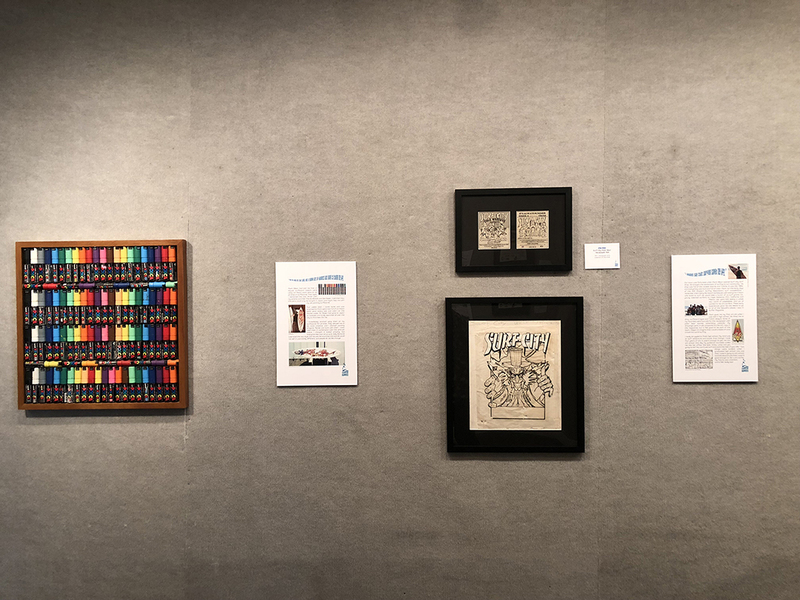 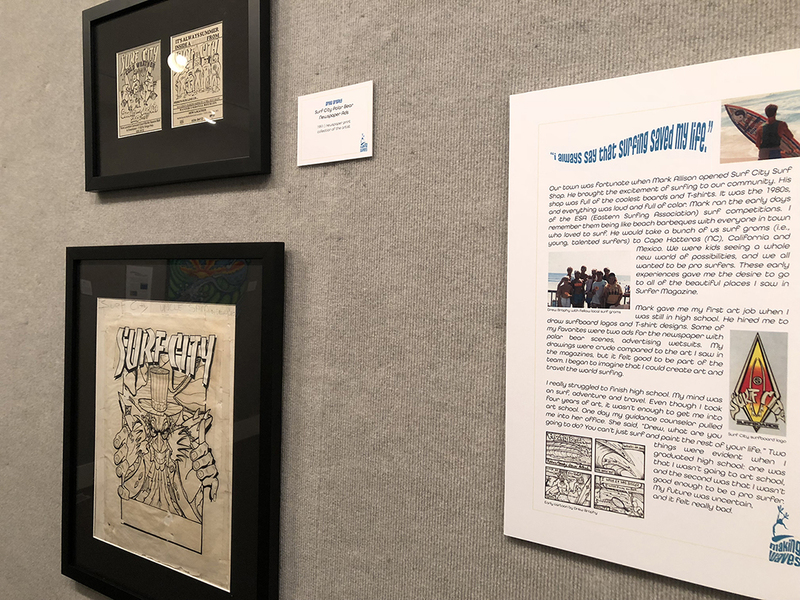 The exhibit is a huge success so far, and we still have a couple months to go! 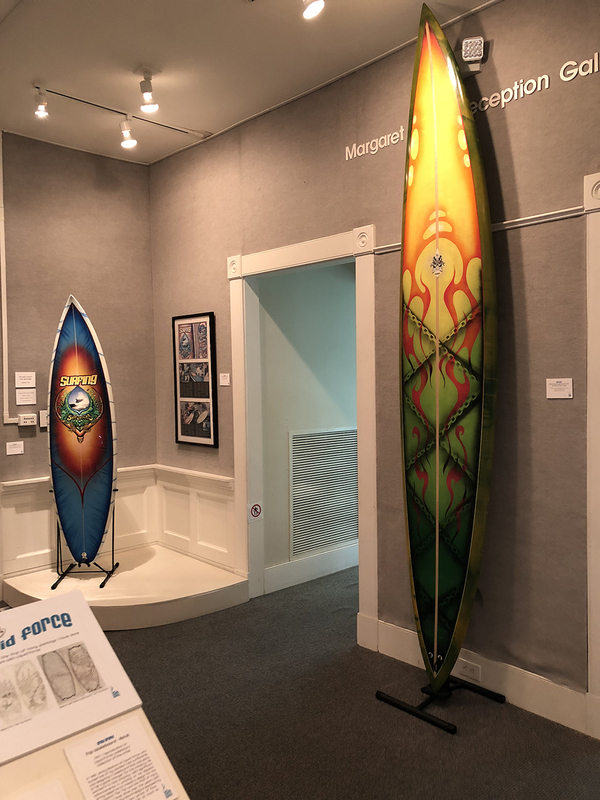 We kicked off the exhibition festivities with an Opening Day festival celebration at the Museum. 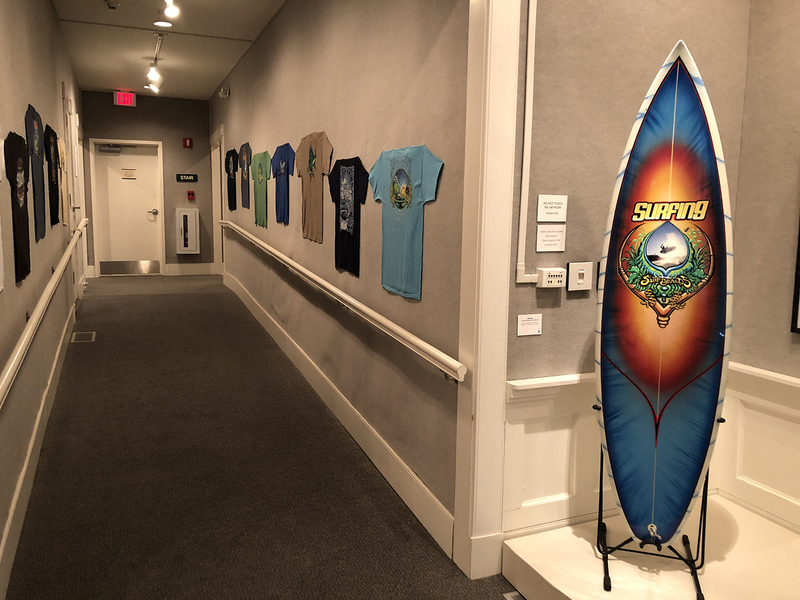 We had live music; food truck; surf and surf-organization vendors; ceramic-surfboard painting art workshop; tiki mask art workshop; tie-dyed bandana workshop; henna tattooing; Thai yoga massage; community yoga session; live hula performances; film screenings of The Endless Summer and A Plastic Ocean; and tours of the exhibit led by Drew Brophy. 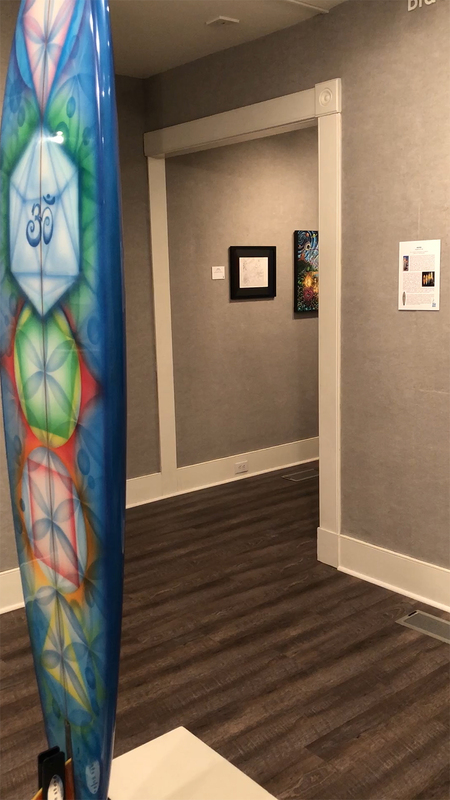 We had over 1,000 people come through between 11 am and 3 pm that day. 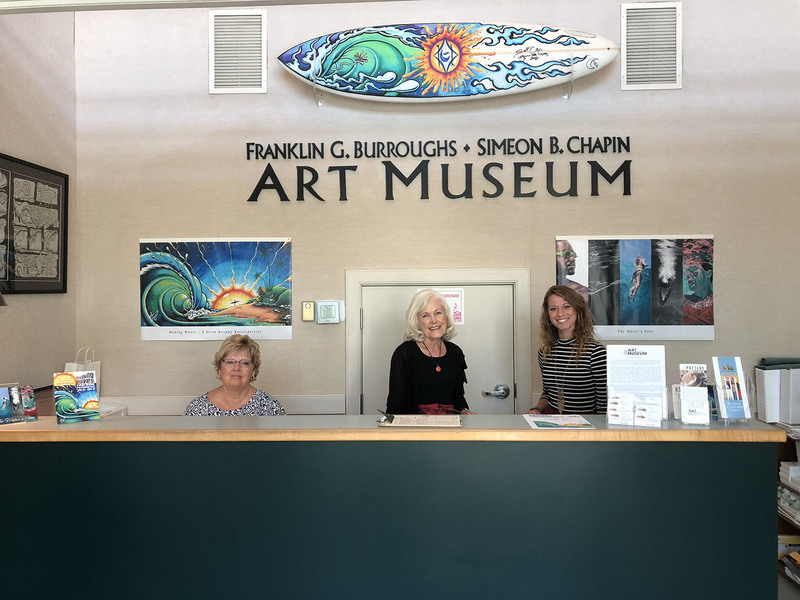 That’s a huge attendance for our Museum! 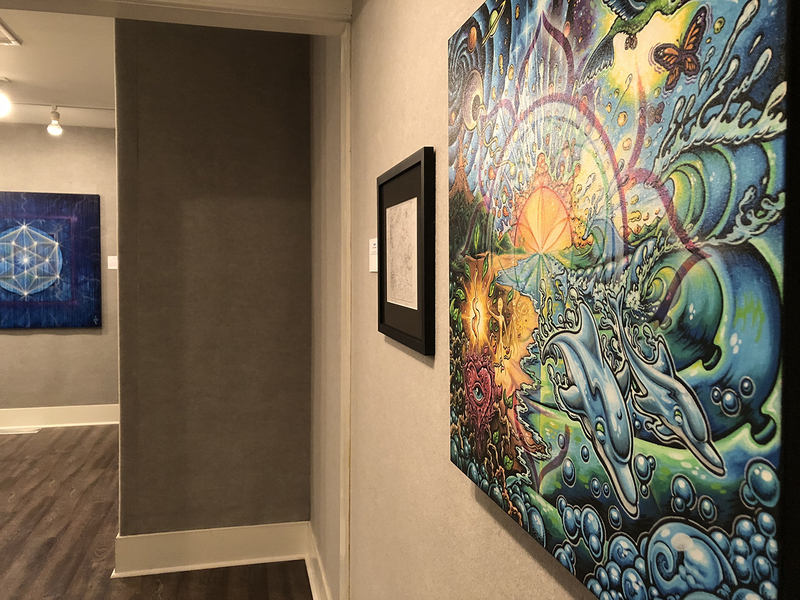 Taking full advantage of Drew’s time here in Myrtle Beach, we loaded him up with scheduled programming. 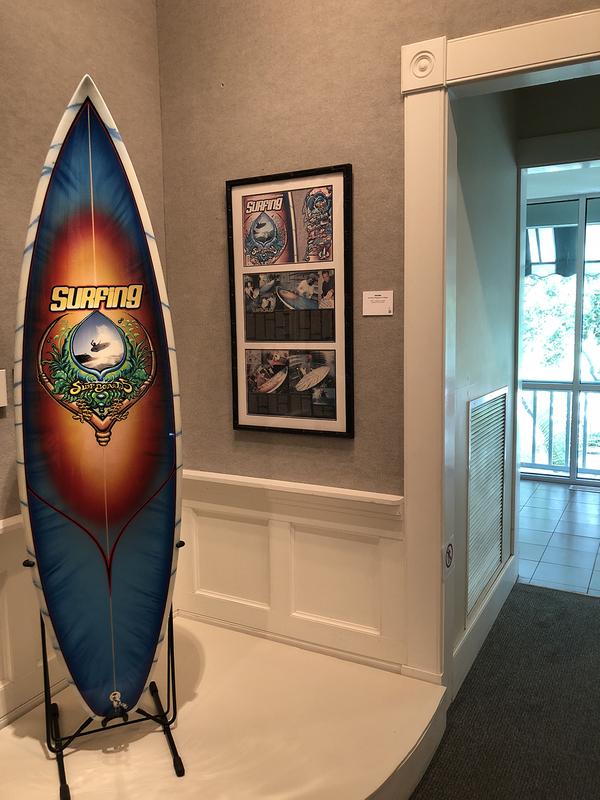 And he was happy to jump right in and make us proud! 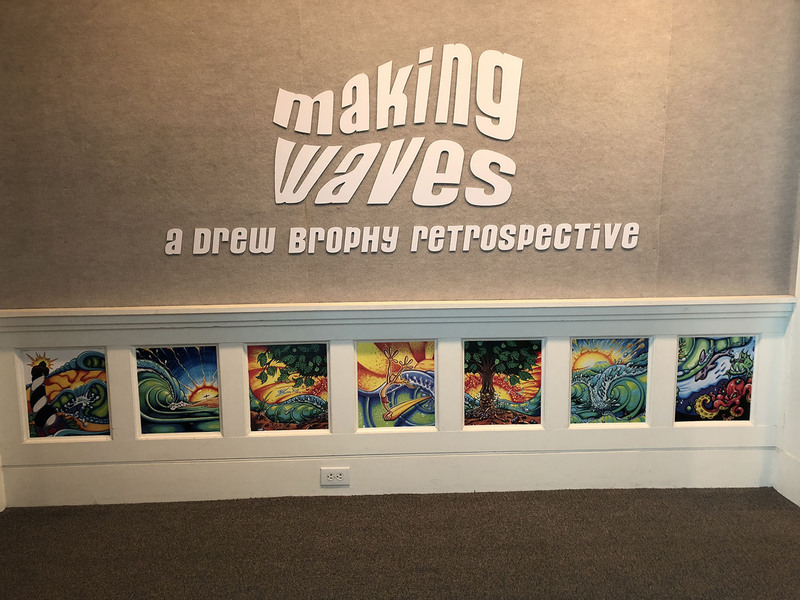 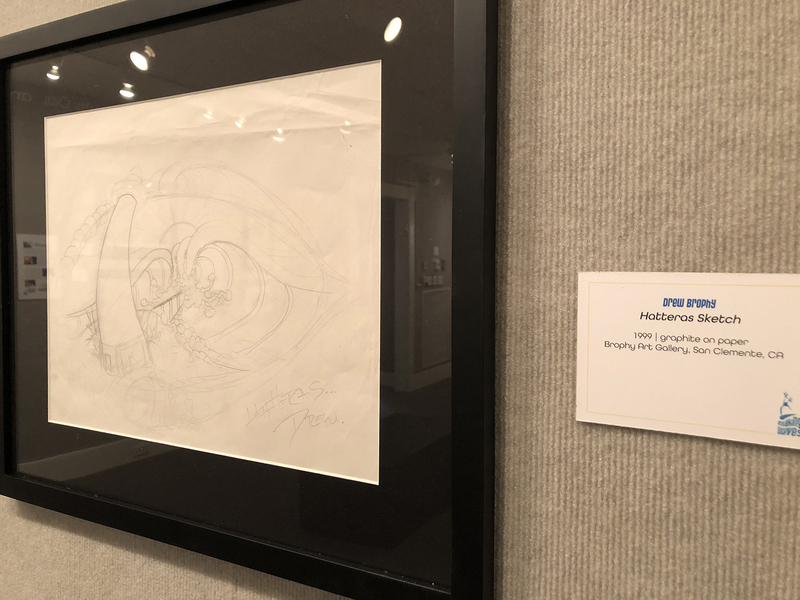 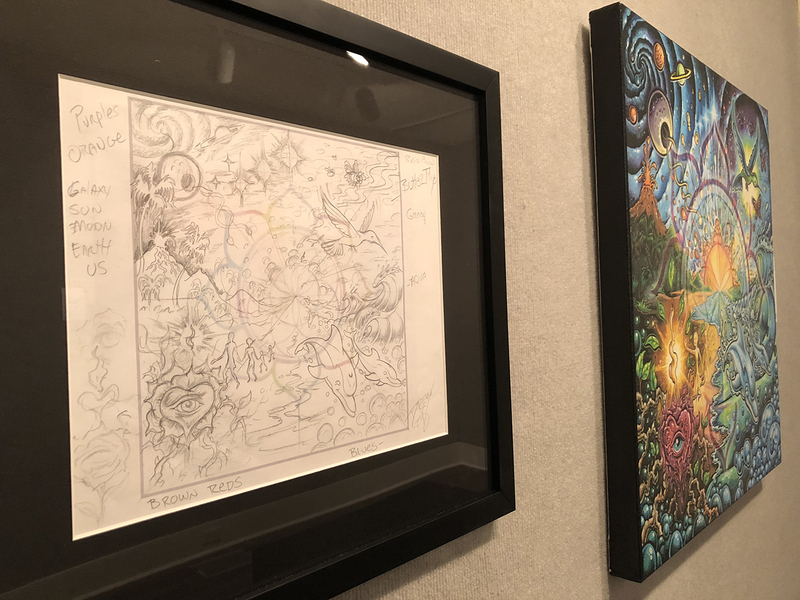 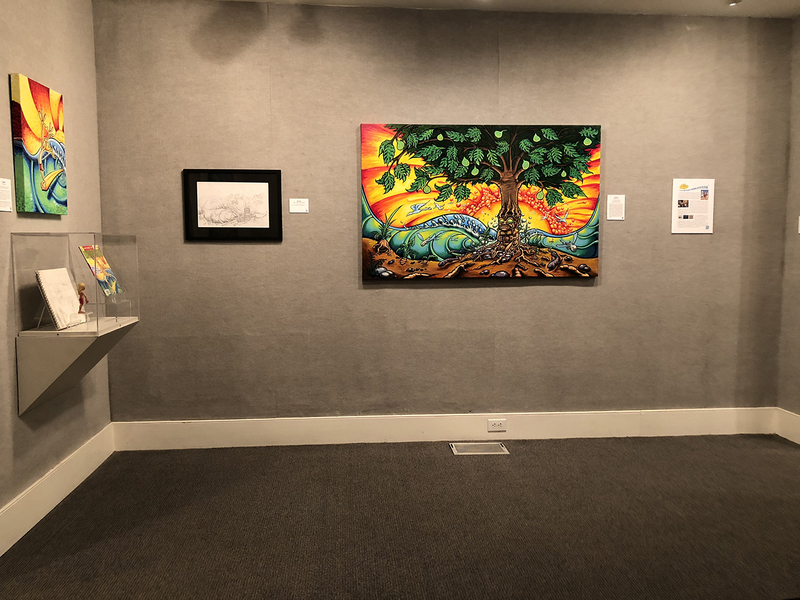 Drew painted a permanent mural on one of the Museum’s outdoor walls; he led two POSCA-pen art workshops; and led additional exhibition tours scheduled throughout the past two weeks. 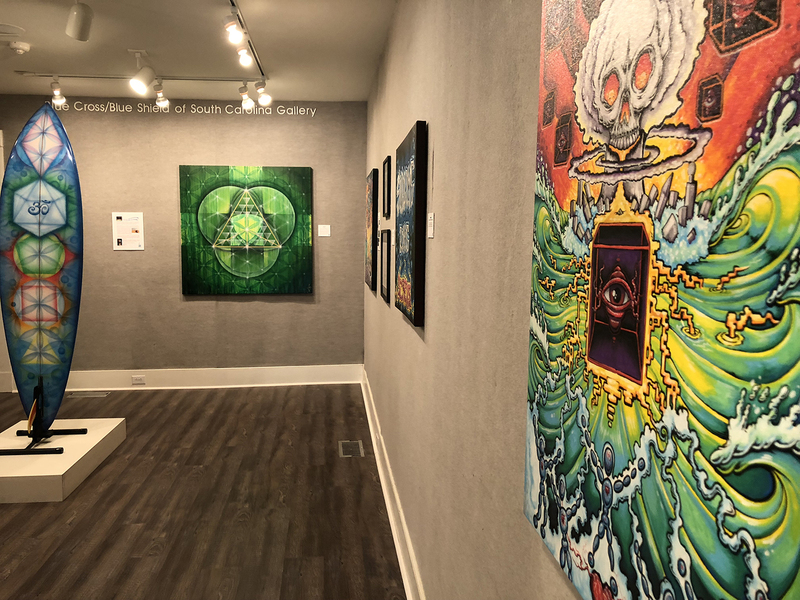 All were extremely well attended. 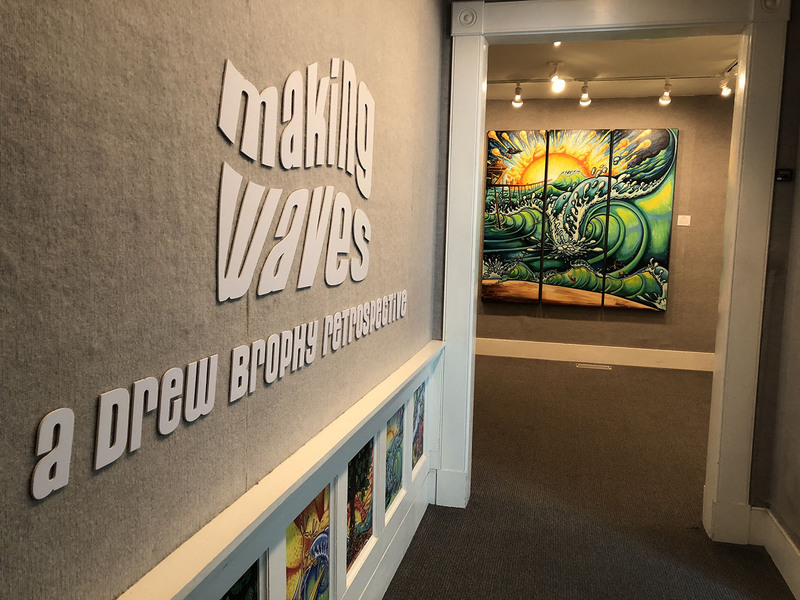 Drew, his family and his art have left a long-lasting impression on our ocean-side community’s hearts, and we are so thankful to you all for helping us make this Museum-dream a reality! 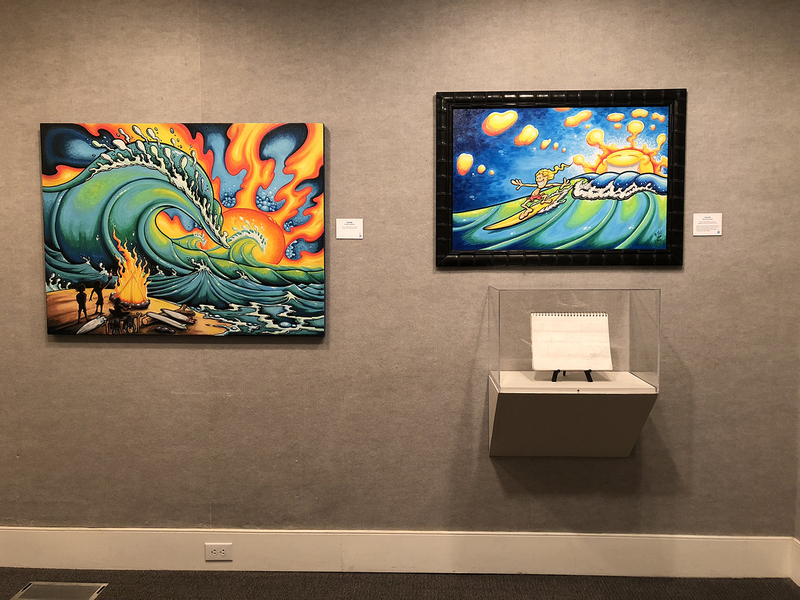 I hope you’ll enjoy the photos and video footage below as a way for you to view the exhibit from afar.